The University of Washington and Capitol Hill Light Rail Stations are now just one year a way from opening to trains and passengers. How is transit going to get you to those stations? Ahead of the University Link light rail extension opening in the spring of next year, King County Metro is proposing a slew of changes to Northeast Seattle Metro routes to better integrate service with the next link in the light rail chain: the University Link. 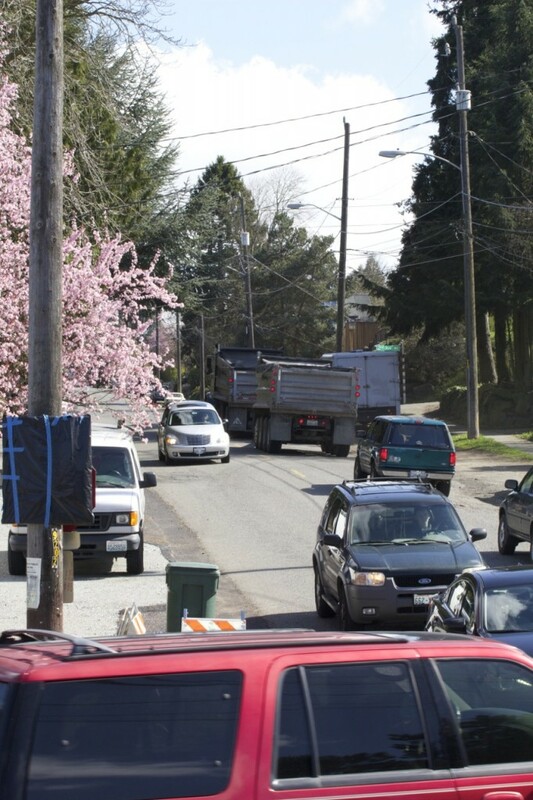 Tonight, Thursday, March 26, from 6-8PM at University Heights Center, Room 209 (5031 University Way NE), King County Metro holds their last open house meeting about these proposed changes (previous open houses were held on Capitol Hill on March 19 and the Eastside on March 25). 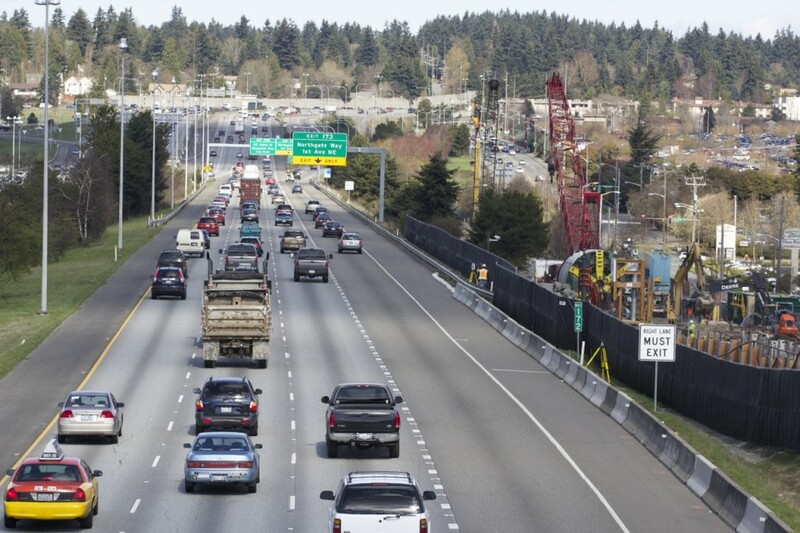 You can see the changes proposed (and the two alternative route change plans) here on King County Metro Online. Additionally, the Seattle Transit Blog has an overlapping, interactive map illustrating the differences (more on this below). We will be at the open house, and plan to provide live coverage below this post. The question for Northeast Seattle transit users regarding proposed route changes appears to be (generalizing here): Are we willing to trade in under-performing routes and stops for increased frequency? We asked around, and this Metro stop sign, with the daisy logo in the lower left corner, dates to at least the mid-1990s. (Stop #38000, west-bound on NE 65 Street and Ravenna Ave NE). For example: Could you imagine life without the good ol’ 71 Express? It’s tough, especially for residents in Wedgwood and View Ridge where service would be reduced. But what if it were replaced by a heavily revamped Route 16 that arrived every 15 minutes (instead of the 71’s 30 minutes) and created an enhanced east-west transit corridor from Green Lake all the way to Sand Point Way? Are residents willing to walk a little further for changes like these? More on the map I mentioned above: For a visual, flipbook-style look at present service and proposed changes, we recommend checking out the map found in this Seattle Transit Blog post. Hover your cursor over the map image found there, then click and hold the vertical white line. Move the line left and right to see the changes. 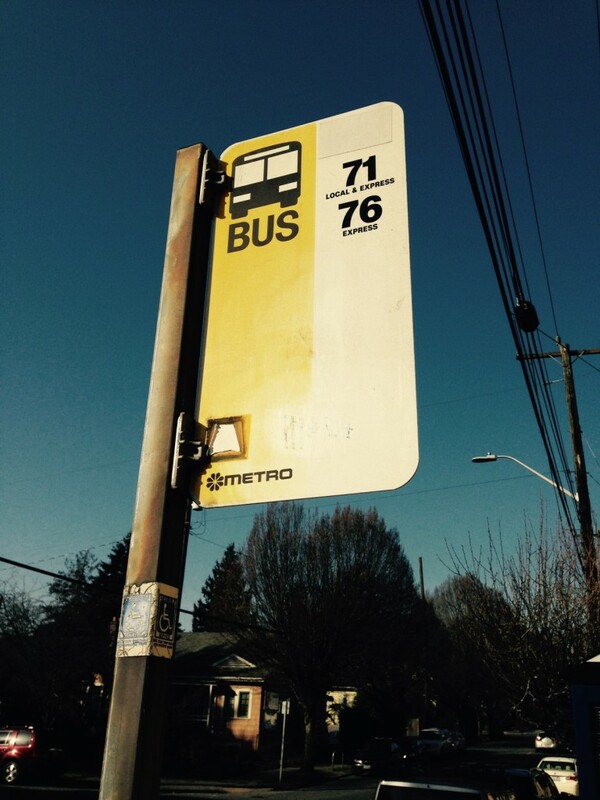 The Seattle Transit Blog posted their take on the changes proposed for Northeast Seattle routes earlier this month. If one is looking for more detail about the proposed changes (and what the differences between Alternate 1 and 2 mean), their post is a good read. Included in the post is a list of route-by-route changes for riders wondering what their new alternatives would be. 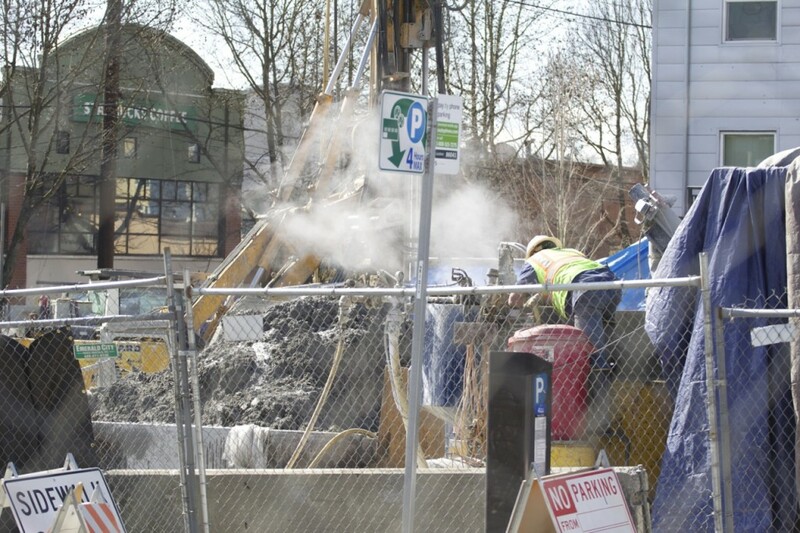 In February 2014, when Capitol Hill Light Rail Station construction started severely disrupting Annapurna Cafe — a business which choose to remain in place and open while others around it shuttered or relocated due to the station construction — Sound Transit cooked up a contest with Annapurna to encourage diners to drop in. 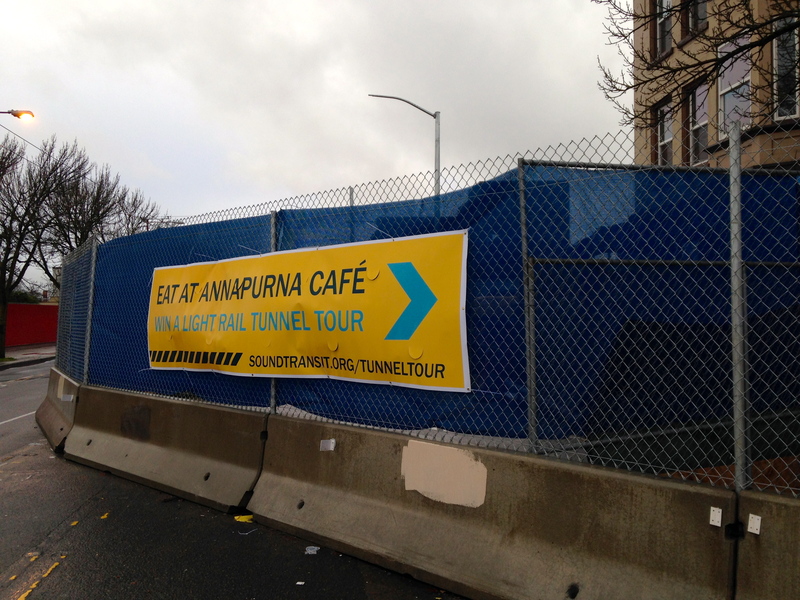 When you eat at Annapurna Café, 1833 Broadway, you can enter to win a Sound Transit walking tour of the U-Link tunnel-from Capitol Hill to the University of Washington. To be eligible, you must spend at least $10 at the Annapurna Café and fill out an entry form at the restaurant. You can enter every time you visit. You must be at least 18 and able to walk the entire 3-mile concrete-lined tunnel. The fine folks at Capitol Hill Seattle also went along on the tour, and you can watch some footage of their travels below. What does all this have to do with Northeast Seattle in the year 2015? 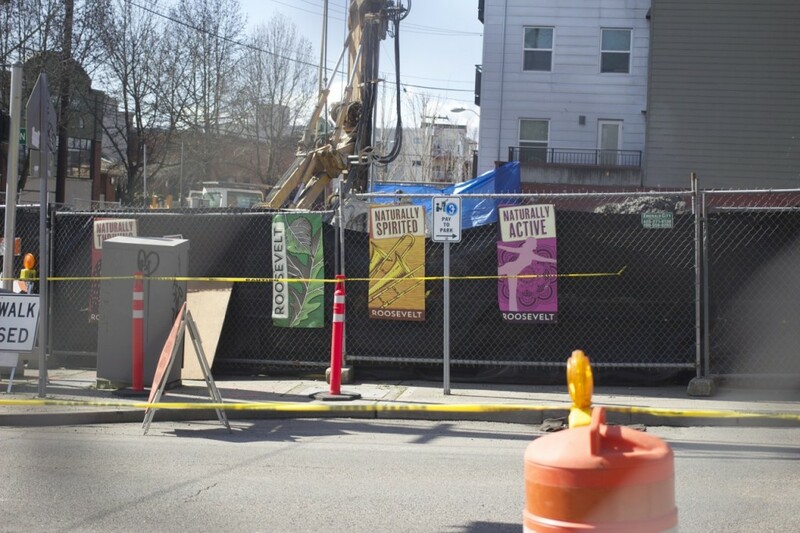 Lucky us, Sound Transit is holding another contest involving businesses located near our Roosevelt and University District light rail construction zones. 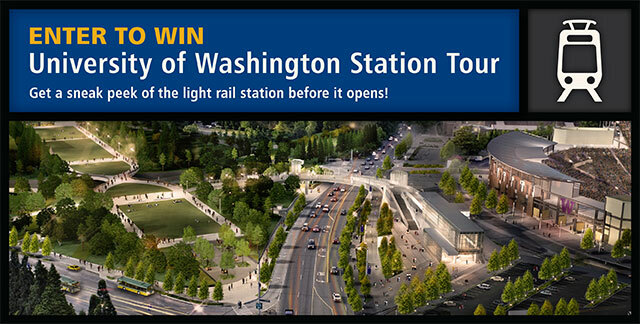 This time, the prize is a tour of the University of Washington Station — open to all in early 2016, but open for winner(s) (sans trains) in the second half of 2015. Also, lucky us, entries can be found not at just one local business but two dozen: 10 near the future University District Station, and 14 near the future Roosevelt Station. And we only need to spend $5 at these businesses to receive an entry form. To be eligible, you must spend at least $5 and complete an entry form at one of the participating businesses. You can enter every time you visit. You must be at least 18 years old. A drawing will be held in May 2015 to select the winners. You will be notified by email or phone. No entry form information will be sold to an outside party and this prize has no cash value. You can see the full list of participating local businesses here (Cedars! Pies and Pints! Toronado! Brooklyn Avenue Dental!). If you win, you can compare the current, finished University of Washington Station to these pictures we took in a 60% finished station, back in January 2013. It’s been a good while since the last Roosevelt Light Rail Station meeting — October 2014 for the last construction open house, April 2012 for the 60% design open house. But that certainly doesn’t mean the station construction site hasn’t been busy. One of the plexiglass viewing windows on the south side of the Roosevelt Station construction area. The walls of the station box were formed first, underground. Since then, the soil in the box has been steadily removed. The two tunnel boring machines put in at the Maple Leaf Portal to the north will emerge from the far side of this pit. 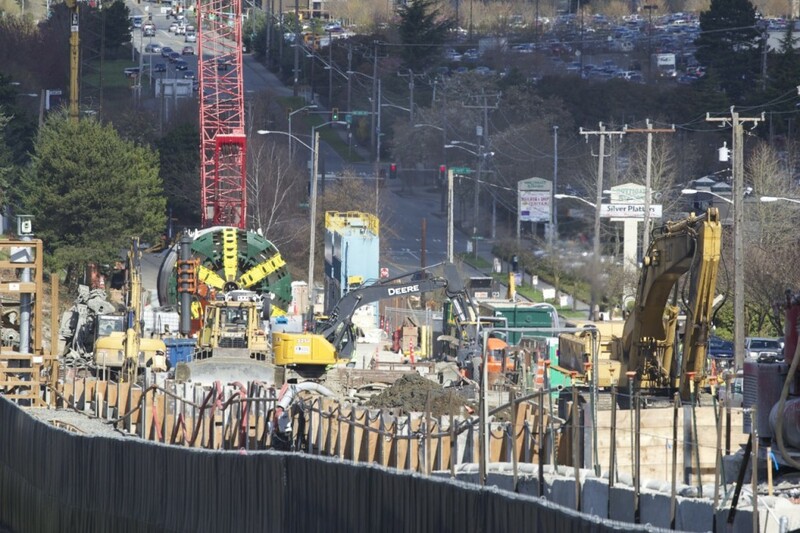 The Roosevelt Station box excavation has come a long way since those meetings, and both tunnel boring machines are steadily making their way south from the Maple Leaf Portal. The first of the two, Brenda, is due to arrive in Roosevelt sometime this spring*. And just what is this station going to look like in the future, when the boring machines are long gone and all this construction is over? We’ll find that out soon. Sound Transit is holding the 90% design open house on Wednesday, February 25, in the Roosevelt High School commons (1410 NE 66th Street). Open house time is 6-8 PM, with a presentation starting at 6:30 PM. In the past, we’ve provided live coverage of these meetings, usually the same post as the meeting announcement. We plan on doing the same for this meeting as well, if the smart phone reception strength permits; however, our current provider seems to have trouble getting through the thick walls of Roosevelt High School, so live coverage might not be possible. Whatever happens with cellular service, we will be taking notes during the meeting (just as if we were doing our usual live coverage) and readers will find our observations available here, once we get back home to HQ. *We’re waiting for a more exact date from Sound Transit, and we’ll update “spring” when we’ve got it. Early 2015 for sure, though. UPDATE (7:08 PM): We’ve heard from Kimberly Reason with Sound Transit who says the agency isn’t saying boo about an arrival time right now, “not even general windows.” Hopefully it’s safe to say that Brenda will likely arrive before 2021, though. 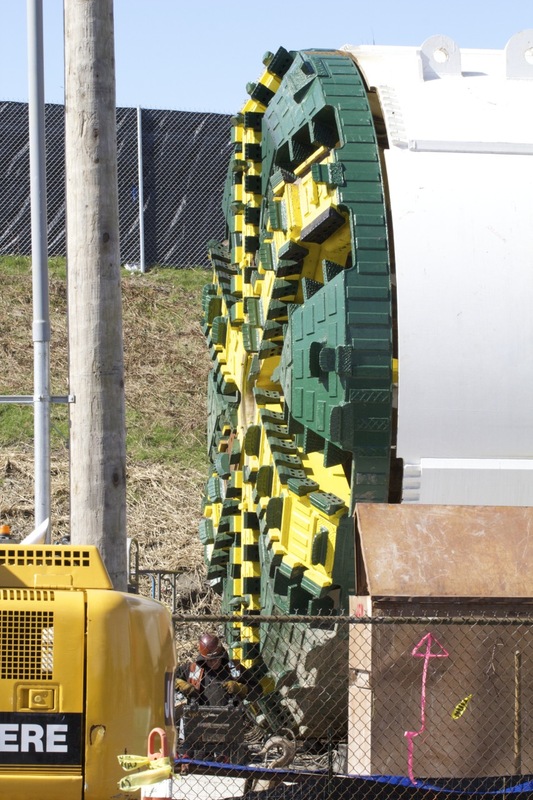 The first of two tunnel boring machines is expected to arrive at the Roosevelt Station site within the next few weeks. Launched in July, it’s currently working its way through the ground just a couple blocks north of the excavation site. 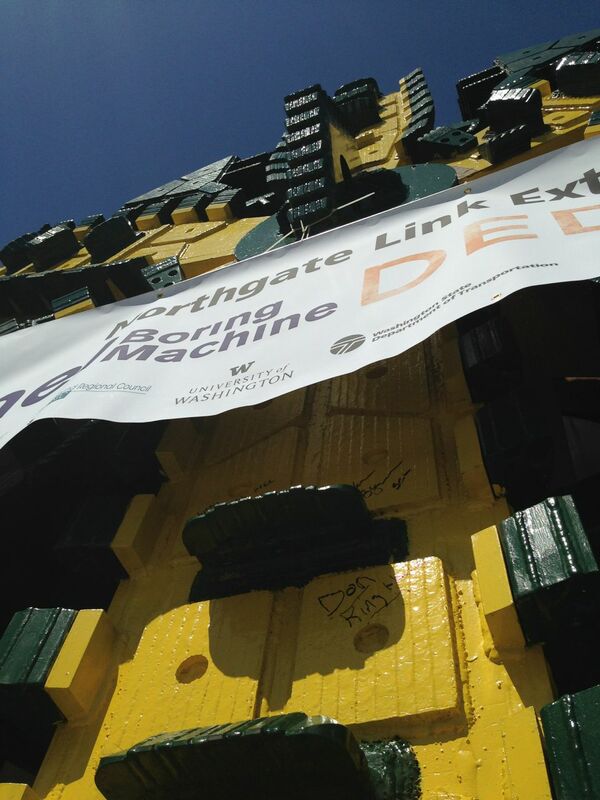 It’s already traveled more than 7,400 feet from the Maple Leaf portal. 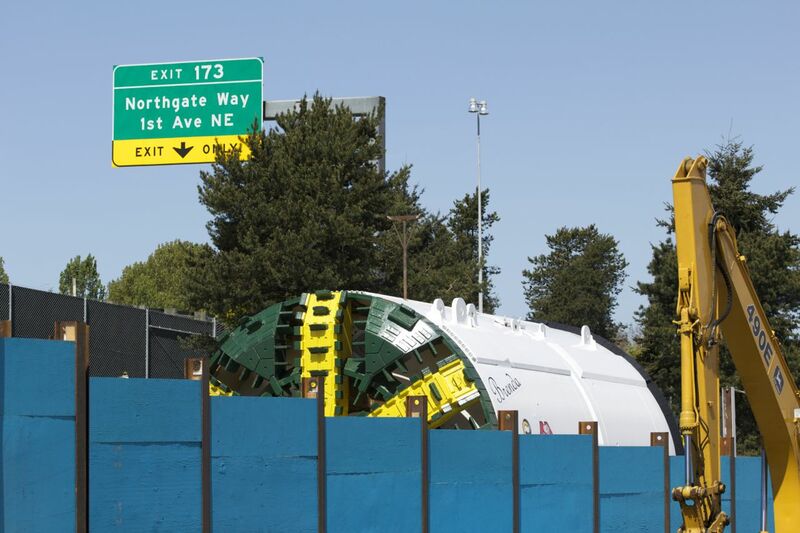 The other tunnel boring machine is following a parallel path for a future southbound tunnel. 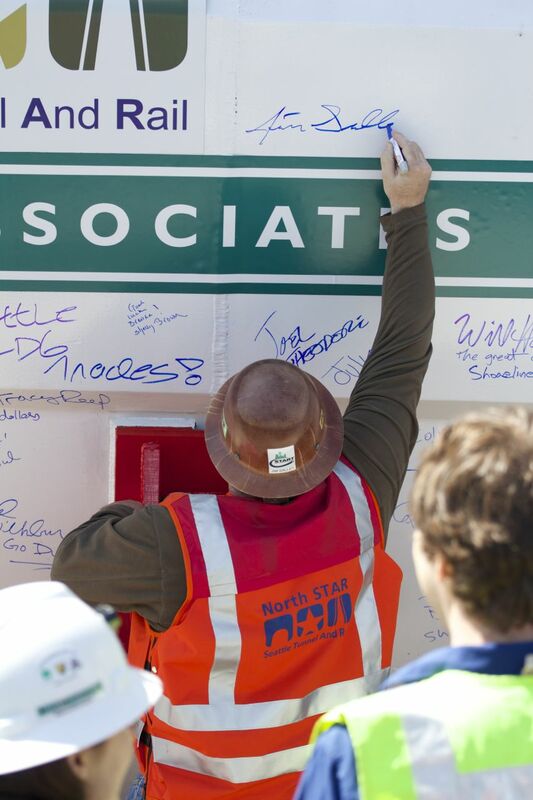 It was launched November 2014 and has traveled more than 1,500 feet to just north of NE 85th Street. UPDATE (Friday, February 27): The slides from Wednesday’s presentation have been posted. Click the image below to download the 14.9 MB PDF. South entrance of the Roosevelt Light Rail Station, as seen from the SE corner of NE 65th Street and 12th Avenue NE (Toronado corner). Click to download the 14.9 MB PDF of the presentation. 1. 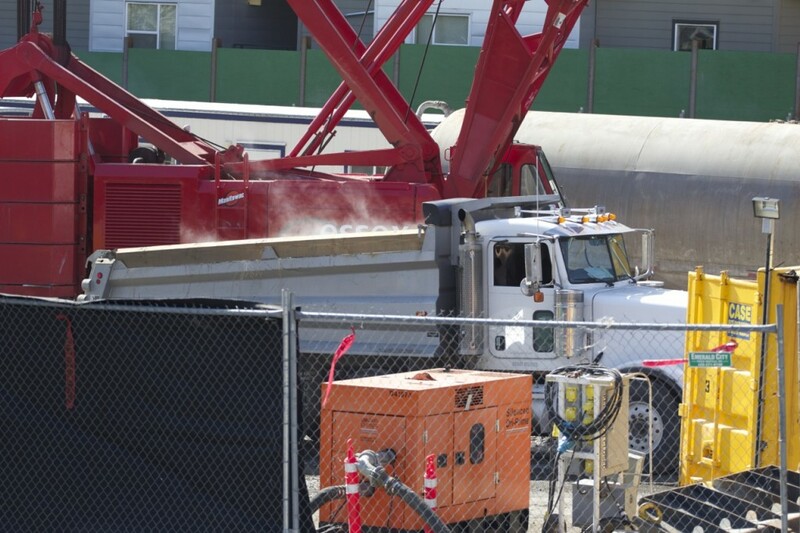 Capitol Hill Station’s big red crane has been disassembled and the pieces trucked up to the Roosevelt Station construction site. 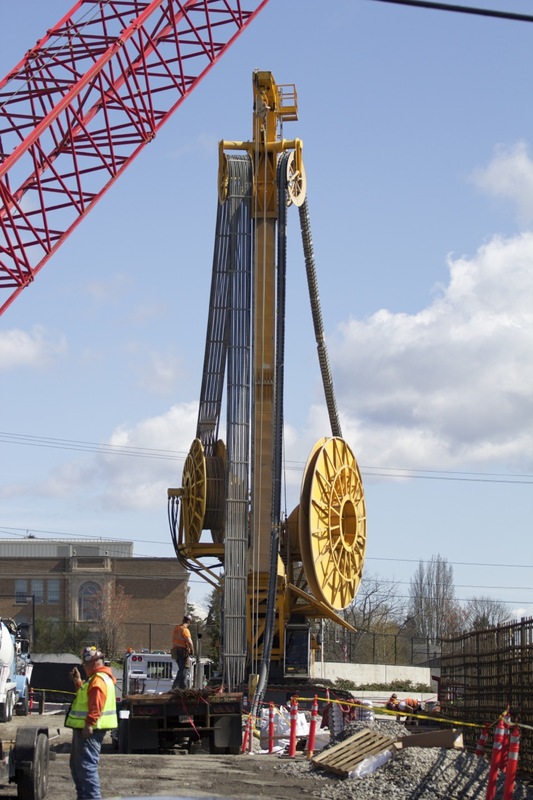 Assembly has already begun during normal construction hours; however, Sound Transit will be adding a Sunday work day this weekend, on August 17, to put together the crane’s jib and hoist it into place. Work will occur during daylight hours and start at 9 AM. And you should totally go check it out when it’s being hoisted because it’s gonna be something to see. 2. 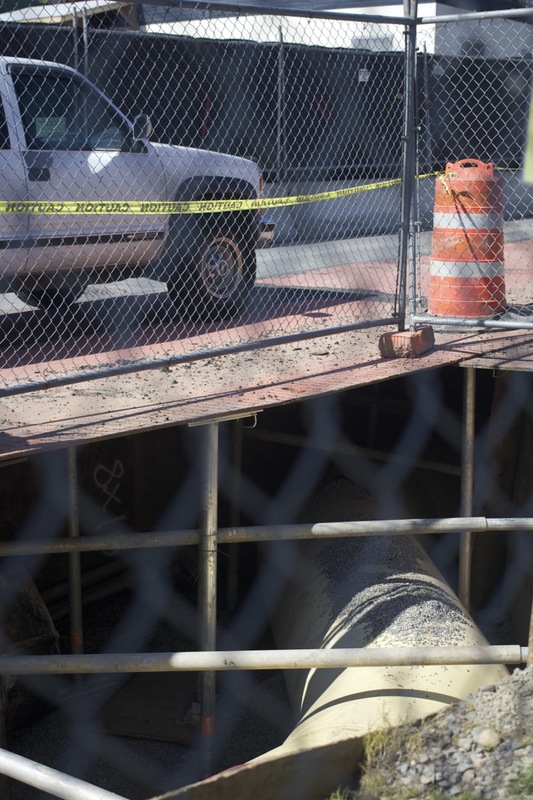 As soon as Monday, August 18, construction crews will start work installing a drainage line from the construction site to a sewer line in NE 67th Street. This project is expected to take up to three weeks, with work occurring between 8 AM-5 PM on weekdays. 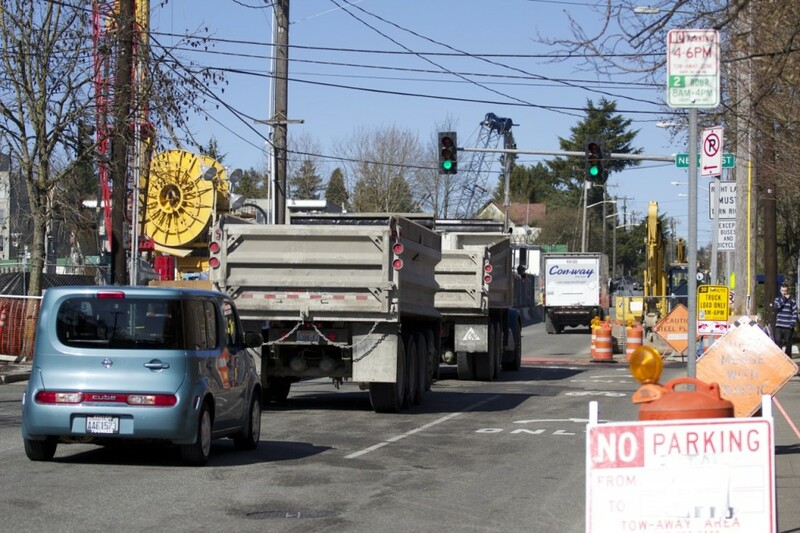 Crews will work westward starting from just east of Roosevelt Way NE on NE 67th Street. 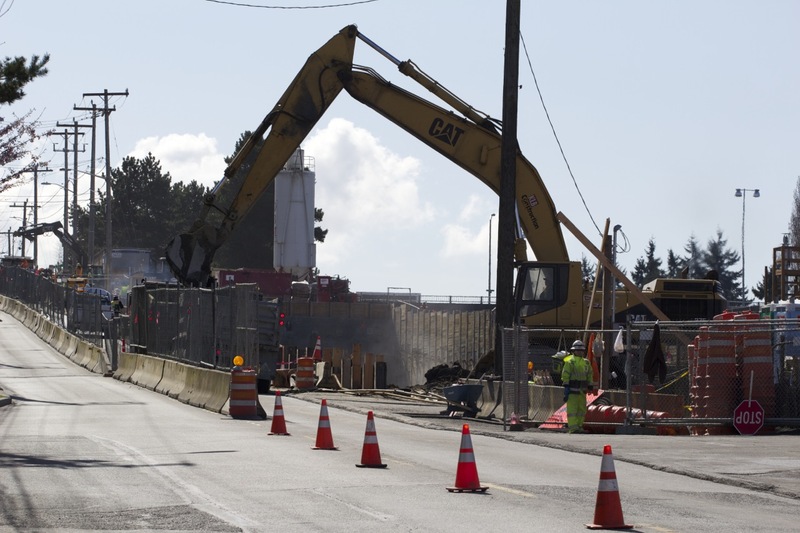 Roosevelt Way will be reduced to one lane from 9 AM-3 PM for approximately two days during the first week of work. 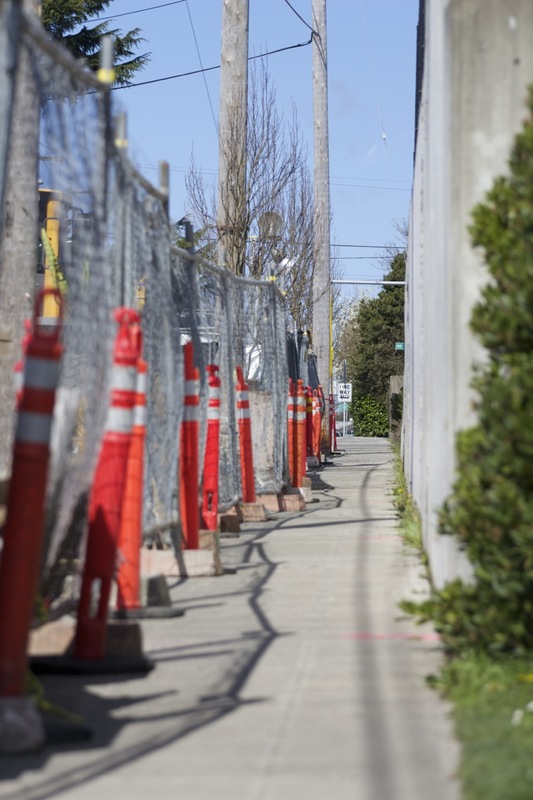 Once the work has traveled to the west side of Roosevelt Way, the sidewalk and parking lane on the south side of NE 67th Street will be closed during work hours. Access to residents and businesses will be maintained, but minor delays during work hours should be expected. 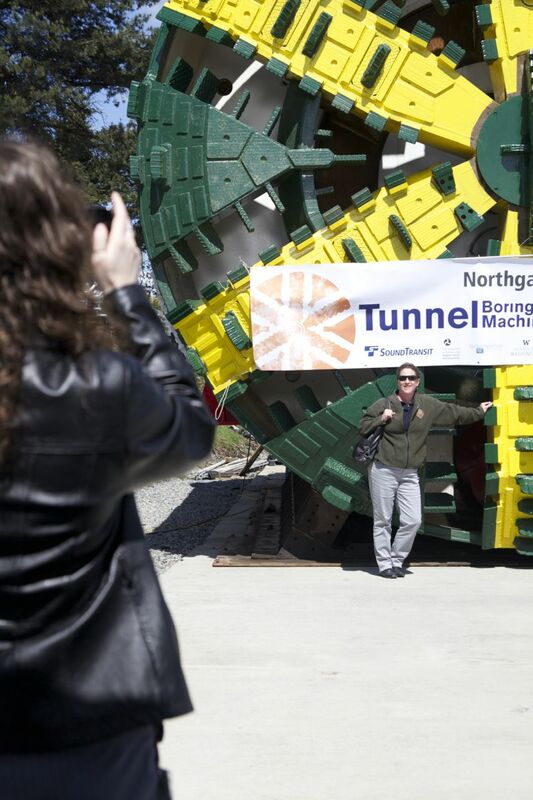 The Northgate Link tunnel boring machines are not yet near the University of Washington campus, but a whole bunch of monitoring equipment is about to arrive. 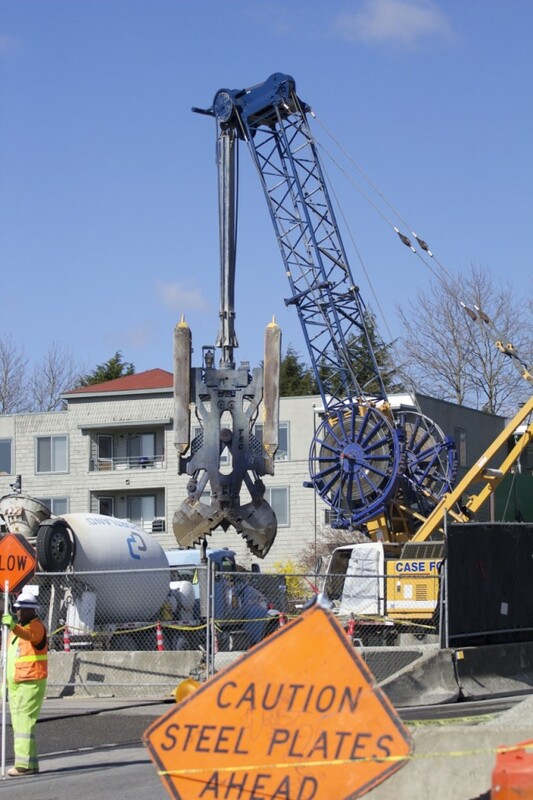 Sound Transit will start installing equipment for 16 monitoring sites around the UW campus over the next couple months, starting here in August. 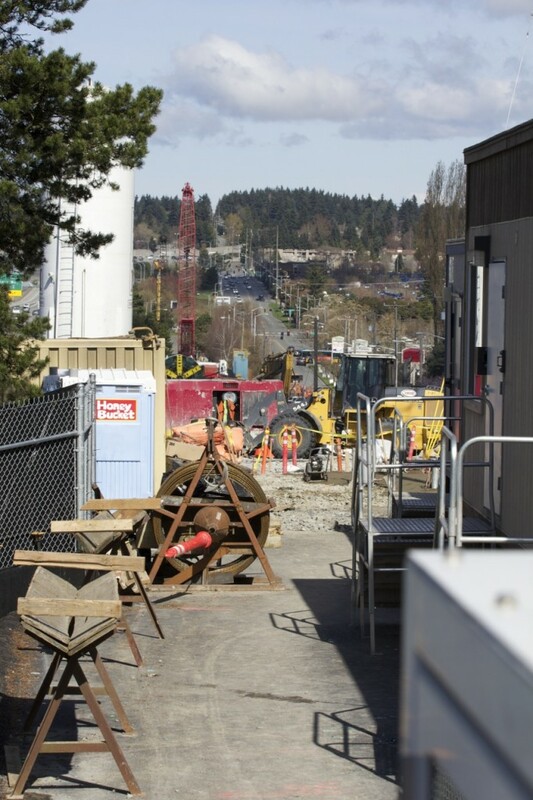 The equipment will monitor the ground, utilities, and buildings located above the light rail alignment during tunneling on campus. 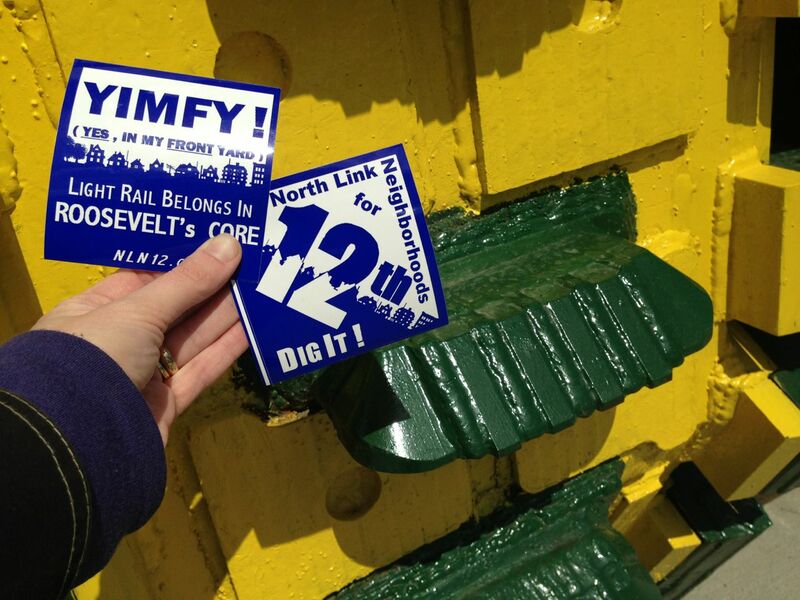 Stickers on buildings: Building monitoring stickers, called structural settlement points, are 3″x3″ stickers that crews affix to the outside of buildings and check regularly for any movement. 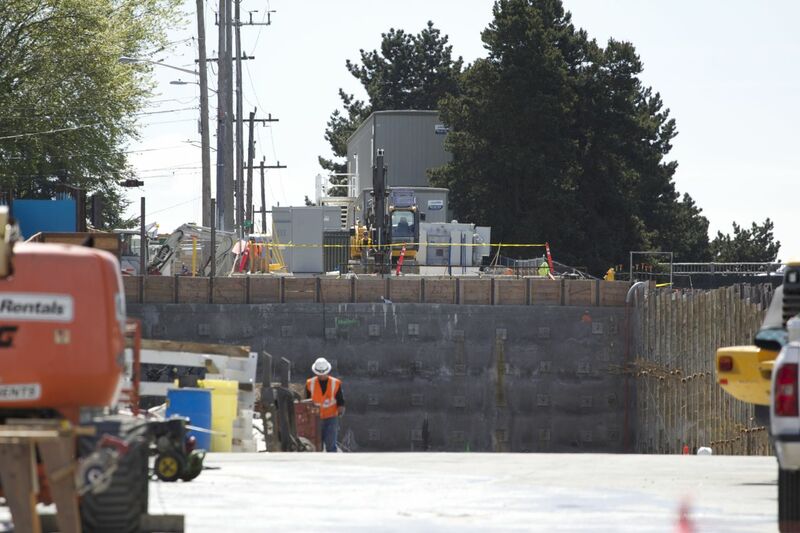 Between the U District Station up on Brooklyn and the University of Washington Station down on Montlake, nearly one mile of tunnel will pass under the university’s campus. 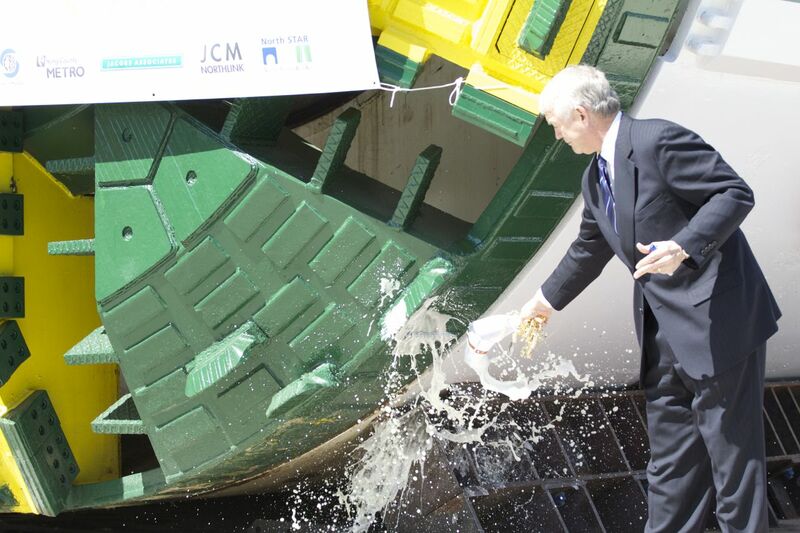 TBMs are expected to arrive at the U District Station in late 2015. 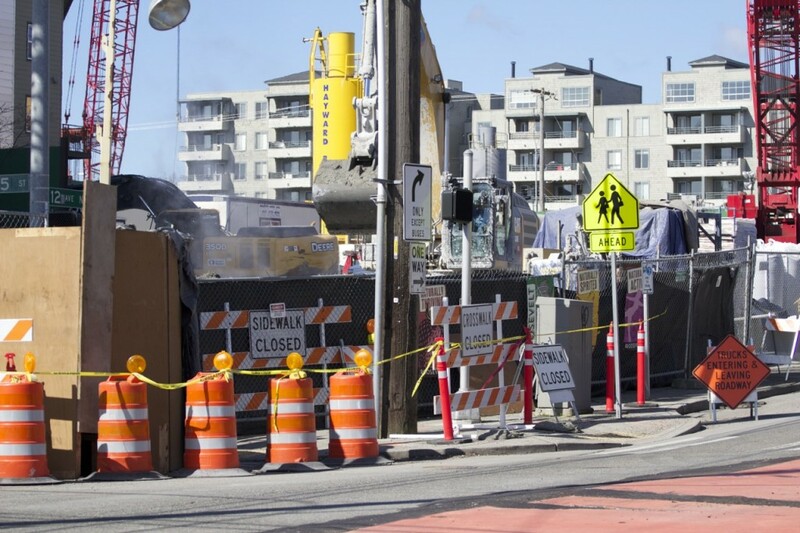 A big ol’ tower crane used to help construct the Capitol Hill Light Rail Station is finished with its job on Broadway and is shortly headed north to the Roosevelt Station construction site. Sound Transit plans to start delivery of Big Red* early Sunday morning on August 10. 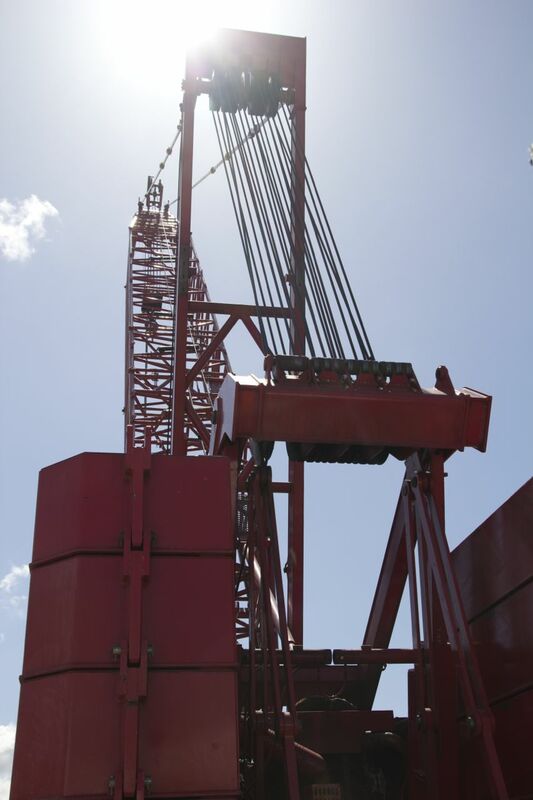 Due to the size of the loads, the crane parts must be delivered at night to minimize traffic disruptions and such. Midnight-3:30 AM on Monday, August 11 through Wednesday, August 13. 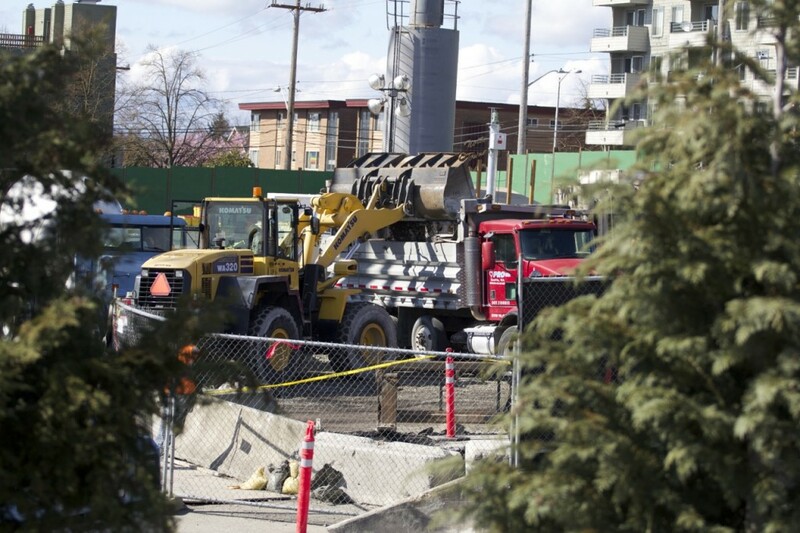 Residents may hear “intermittent truck noise” as the crane parts arrive and are off-loaded at the construction site. The Krøll 1800 (Capitol Hill’s is the metric model) was set up with its enormous 250-foot jib about 100 feet off the ground. The model can be as tall as 200 feet. 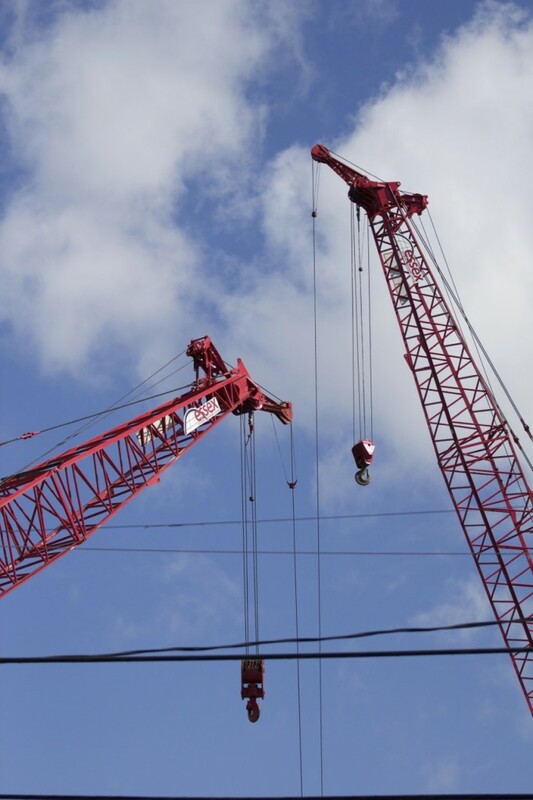 It can lift more than 30,000 pounds at full extension and more than 130,000 when operating at a shorter radius, according to the manufacturer. Some pictures of Big Red’s assembly can be seen here. 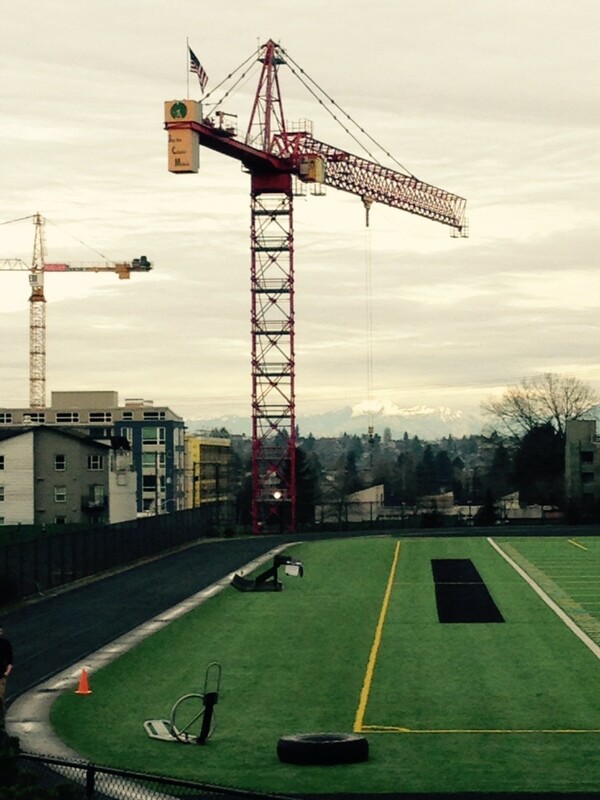 The crane was installed at the Capitol Hill Station construction site back in late January, 2011. 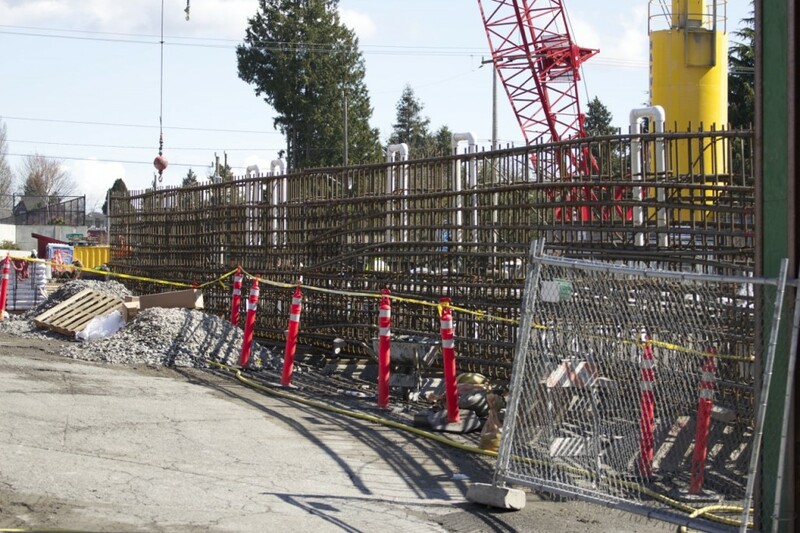 Visit Sound Transit’s Roosevelt Station project page here. 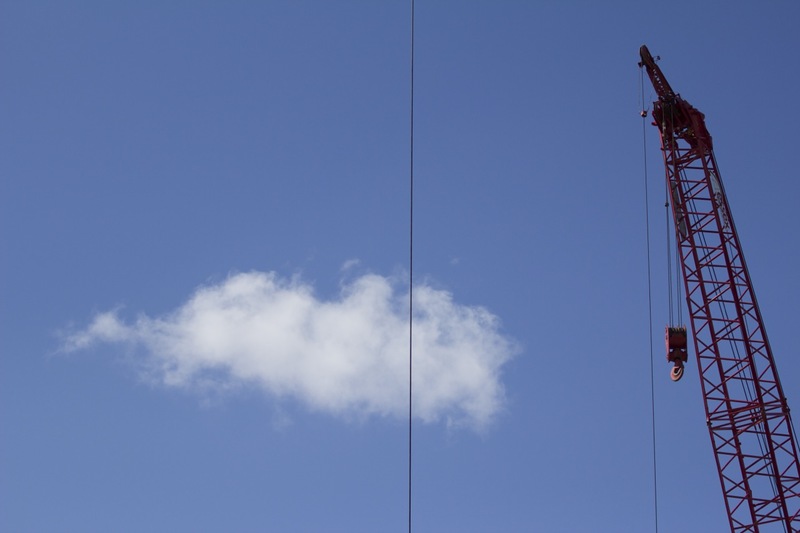 *My nickname for the crane. It is big and red, after all. 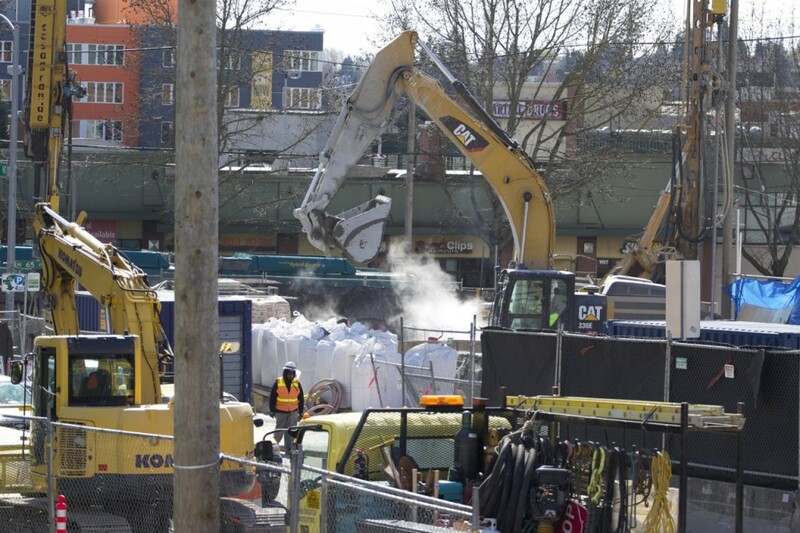 The U District Station construction site is a busy one. Look for this trend to continue in August. 2. Drilling along the shoring walls is almost complete! Only the south shoring wall is left (currently 75% finished), and expected to finish up by the end of August. 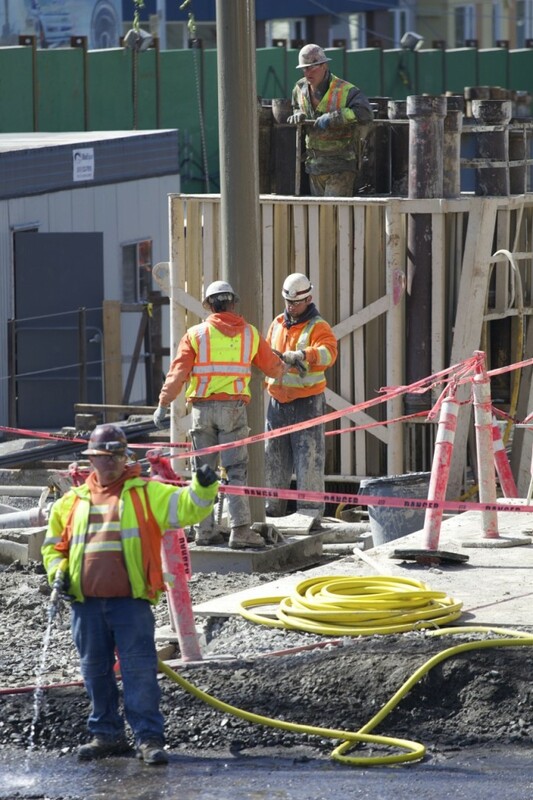 As crews dig down, they will install long nails, called tie-backs, into the soil to secure the underground station walls. Crews will also be installing long metal beams, called struts and wales, across the top and sides of the box. These braces hold the soil during station excavation. Crews will dig until they reach about 95 feet below ground. Excavation will be ongoing through spring 2015. 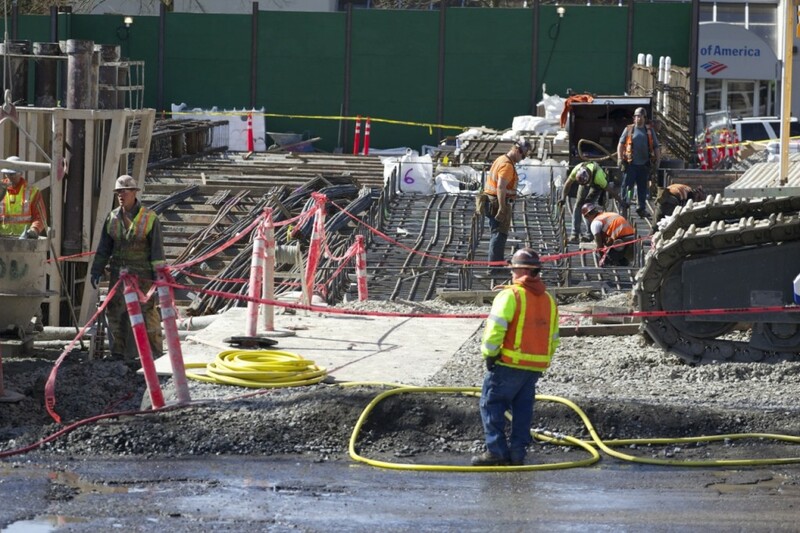 Visit Sound Transit’s U District Station project page here. 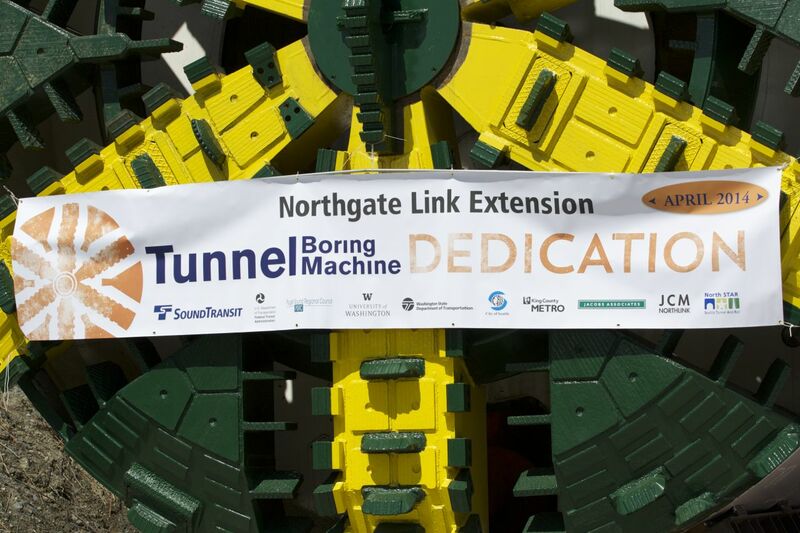 On Monday, April 28, the first of two tunnel boring machines (TBMs) that will carve the underground portion of the Northgate Link Extension was dedicated at Sound Transit’s Maple Leaf Portal site. This was the last close-up opportunity for Brenda as the TBM is readied to start her journey underground to Roosevelt Station in June. Brenda is not Big Bertha’s younger sister. No. Brenda is a veteran TBM, having already carved the paths between between Capitol Hill and the downtown transit tunnel wall in 2011-12. …on the inside, you can see Brenda’s experience. Here’s where Brenda will start her journey: The Maple Leaf Portal, where the elevated light rail track leading south from the Northgate Station will head underground. 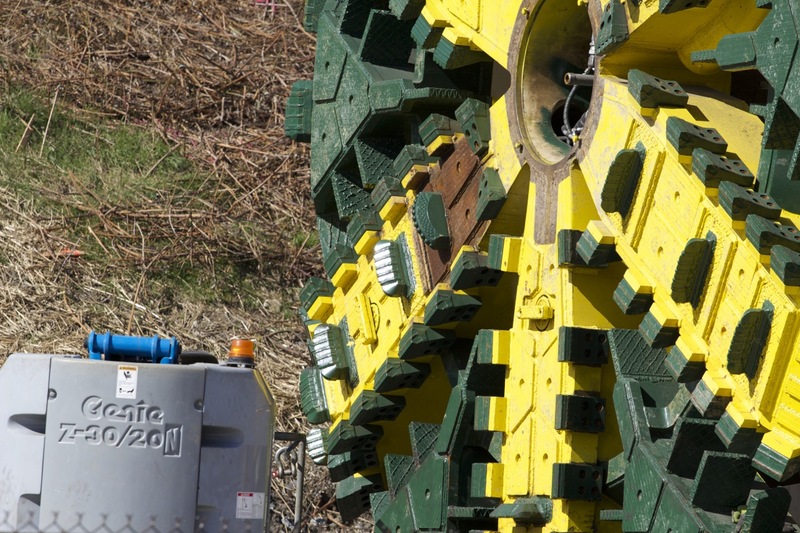 The TBM’s 21-foot-diameter cutter head (the large green and yellow disc on the front of the TBM) is covered with teeth and holes, turns at a rate of 0.1 to 2.5 revolutions per minute, and can excavate an average of 40 feet of tunnel per day. It’s also great for posing with. View inside the cutter head. Here the tailings that have passed through the openings in the cutter head will fall, be carried out by this red screw conveyor, and moved through the body of the TBM. 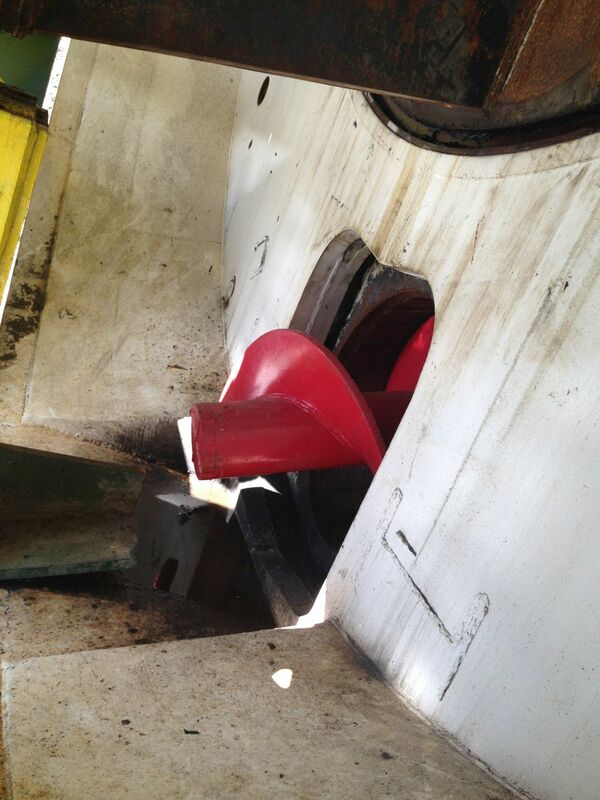 This is the “trailing gear” that follows behind the TBM. 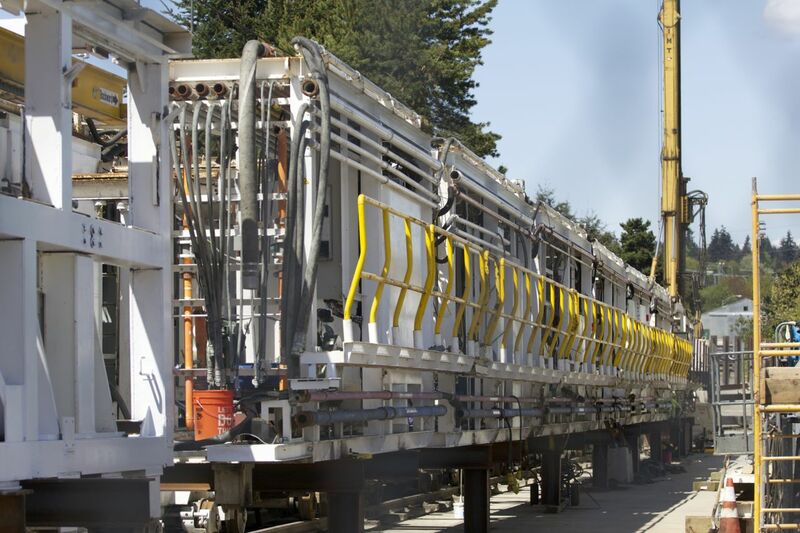 It carries equipment for the boring machine and helps carry the spoils away from the machine. Altogether, the TBM and the trailing gear stretch out to the length of a football field. As the TBM and the trailing gear carve the route to Roosevelt and beyond, supply trains will ferry equipment from the outside world down into the tunnels. 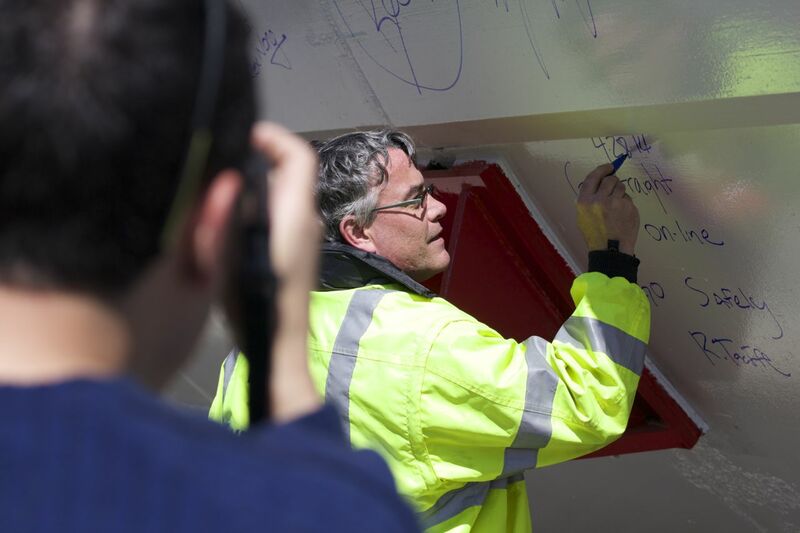 Chief among their cargo will be the pre-cast concrete segments that compose the finished walls of the tunnel as well as provide a surface for the TBM to propel herself forward. It is these supply trains, running along on metal rails down in the tunnels, that were judged responsible for the noise and vibrations experienced by residents in Montlake back in November 2011. 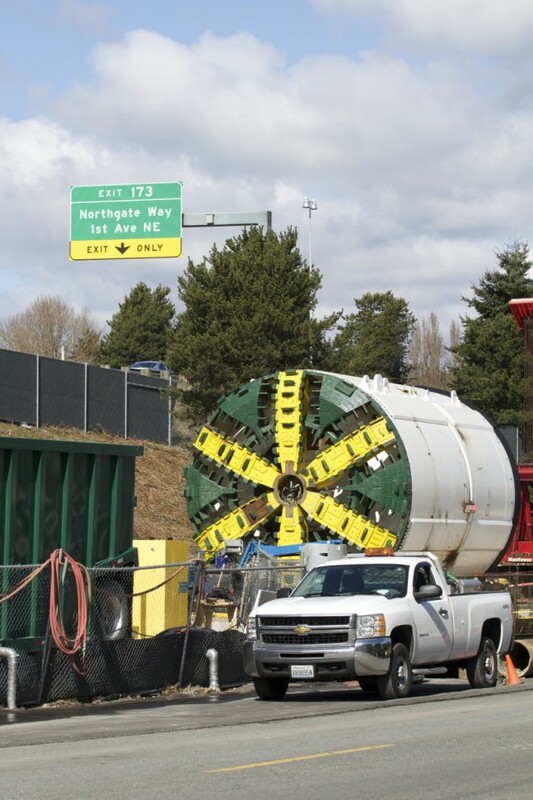 Good news for those living and working (and attending the UW) above the Northgate Link Extension tunnels: Vehicles equipped with rubber tires will be used this time around for underground deliveries. Worm’s perspective of the cutter head. 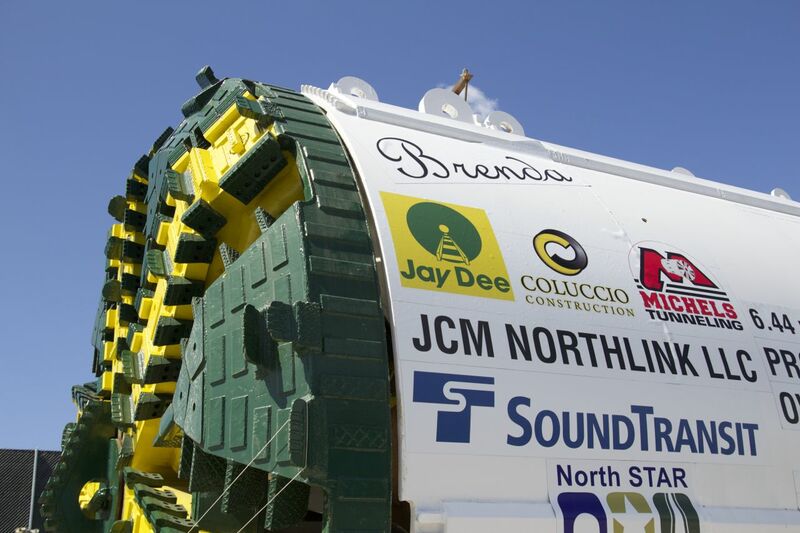 Sound Transit has a great little video showing how tunnel boring machines work. It includes a cross-section graphic of the machine in action, as well as footage from previous excavations. And here’s where we pause the photo essay to share with the Roosevelt neighborhood some potentially great news. The old plan for tunneling south was for Brenda to dig one side of the route to Roosevelt Station, be trucked back up to the Maple Leaf Portal, and begin digging the other side of the route. 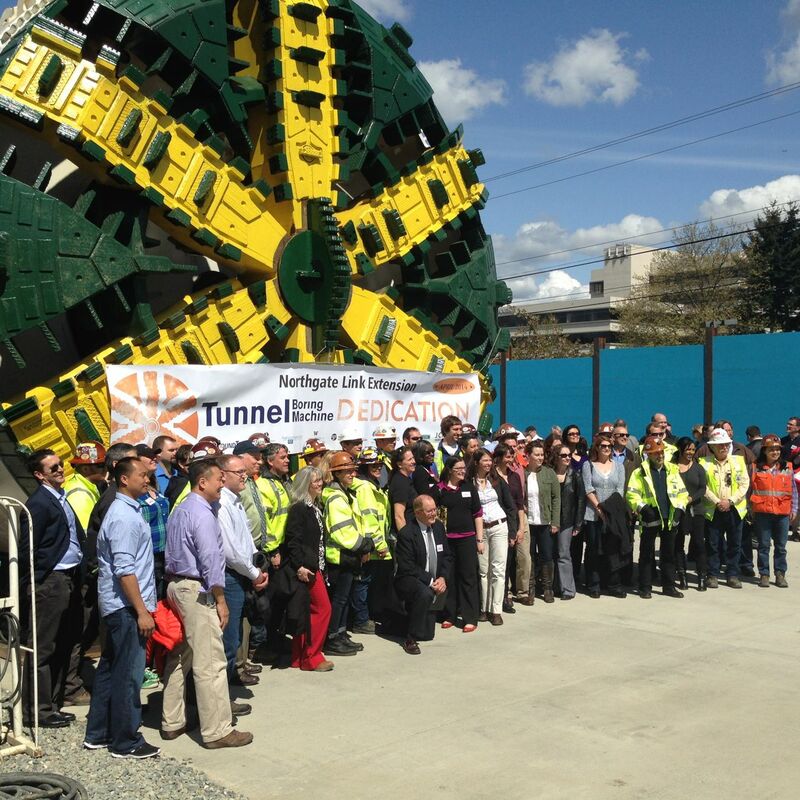 Then a second TBM-to-be-named-later would join her in Roosevelt, where the pair would start their journey south to the University of Washington Station. Muck from the tunneling would travel up to the Maple Leaf Portal site and be hauled away there for Brenda’s solo drilling, but would be hauled out of Roosevelt Station for the remainder of the project. In the new plan the Contractor has proposed two TBMs going from Maple Leaf. The performance of the tunneling and the muck haulage will be closely monitored during the initial drive from Maple Leaf to Roosevelt. If all goes well, the two machines will continue on to UW with spoils removal and haulage continuing from Maple Leaf the entire time. If the new proposal does not perform as planned there could still be muck haulage and/or a third TBM launched from Roosevelt in order to meet the project schedule. What this would mean for the Roosevelt neighborhood is that after the dump trucks bearing away the soil from the station excavation are gone, they’d be GONE. 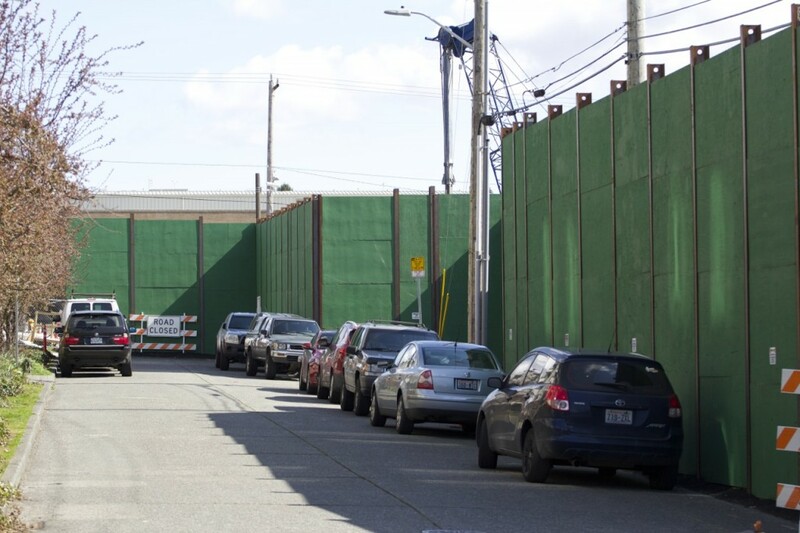 Muck from the entire Northgate Link Extension would come out the Maple Leaf Portal and be hauled away there. Again, this new plan is not a given. And it’s going to be a while before anyone knows the contractor’s final decision. 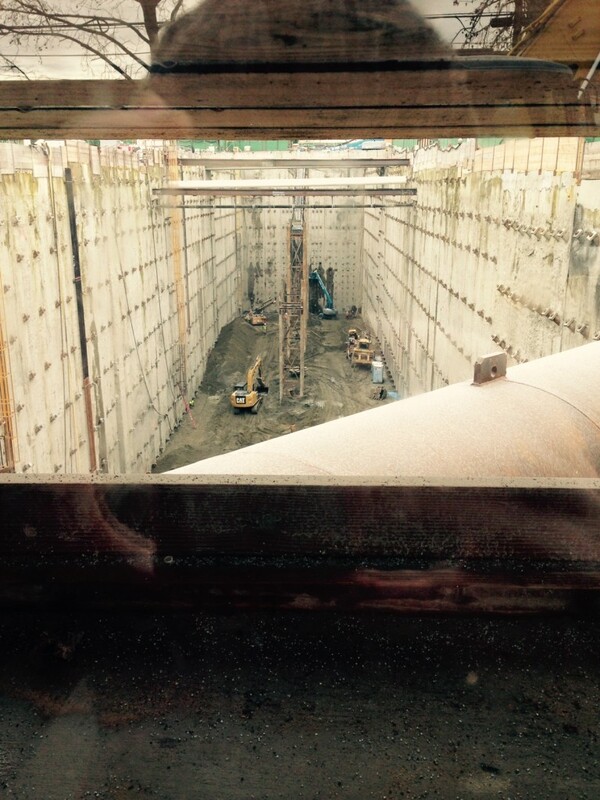 Once Brenda gets digging in June, it will take her 10-12 months to reach Roosevelt Station (via Sound Transit’s Gray). If the second TBM launches from the Maple Leaf Portal five months later in October, the pair won’t see each other in Roosevelt until August 2015 at the earliest. Hey, Roosevelt: Remember when you rallied to bring light rail closer to the neighborhood’s core at 12th Avenue NE (over a station closer to I-5 on 8th Avenue NE)? On January 27, 2005, the Sound Transit board agreed with you, and the Roosevelt Station Alignment was chosen. Here, some stickers from that campaign pose with the machine that’s making it a reality. 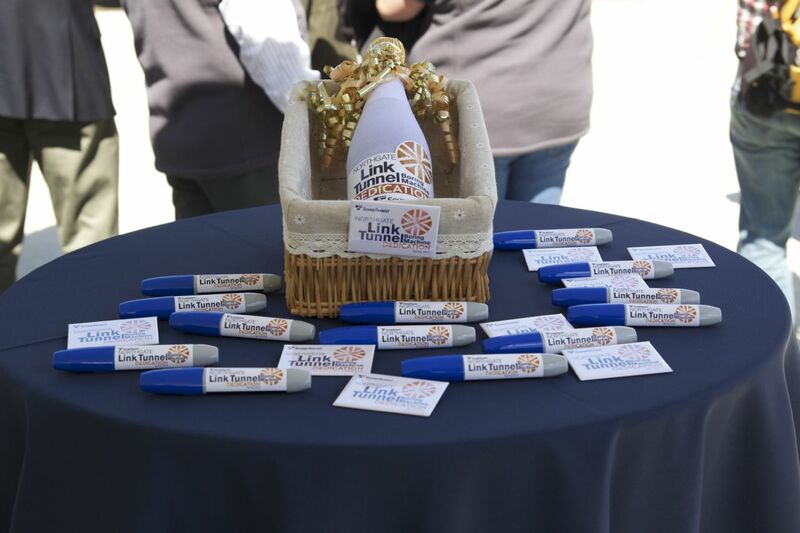 A fragile bottle of dedicatory Washington apple cider sits in the shade along with TBM-signing Sharpies and commemorative pins. 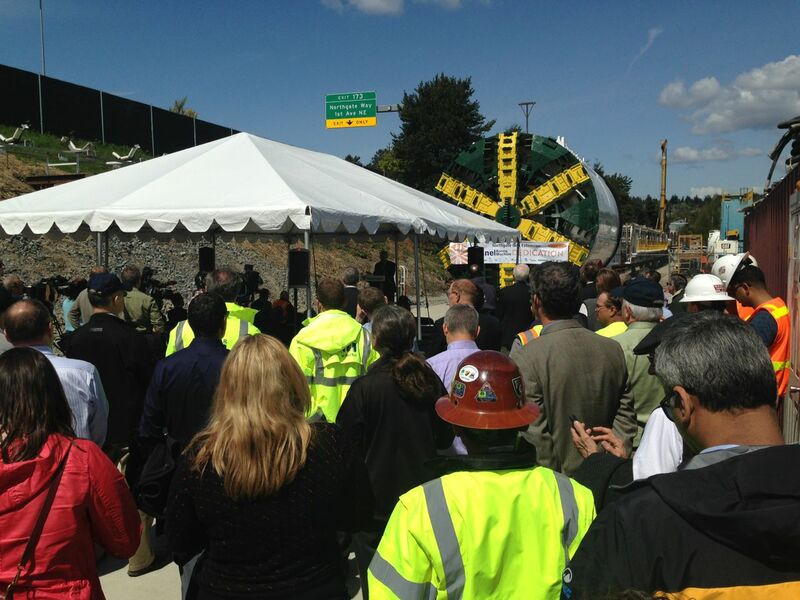 The assembled crowd listens to officials during the dedication. 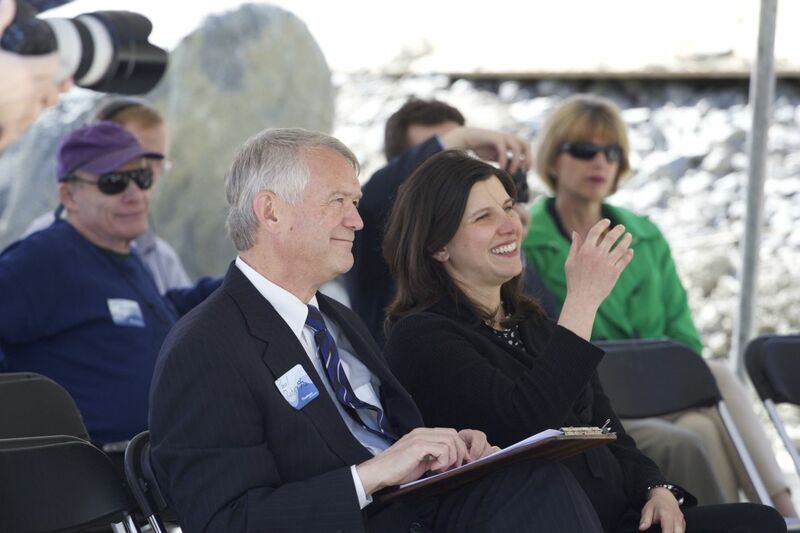 Sound Transit Board Member and City of Everett Councilmember Paul Roberts, and 46th District Representative Jessyn Ferrell, share a laugh during the dedication speeches. Councilmember Roberts anoints the cutter head with a refreshing non-alcoholic beverage. Then the signing began. Gathered participants were encouraged to write on the machine. 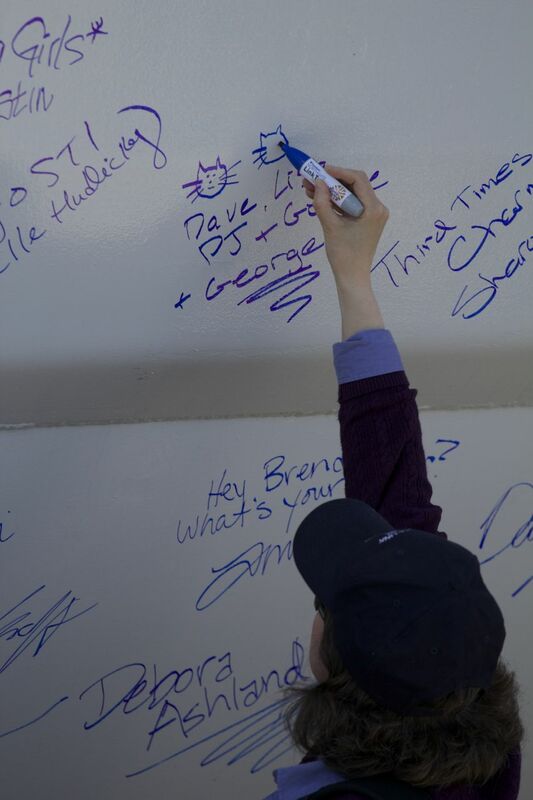 Some just signed their names. There were a few drawings. And more than a few children’s names. 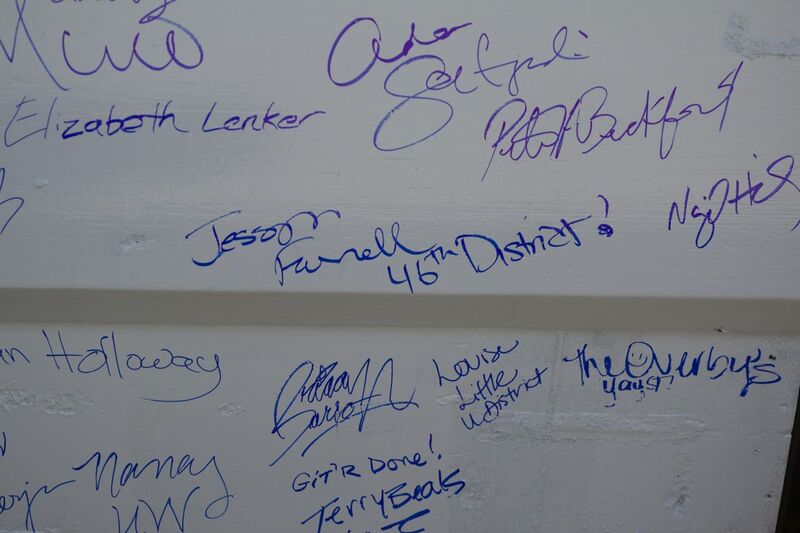 Representative Farrell’s signature joins the others on Brenda’s flank. “Go straight. Go on-line. 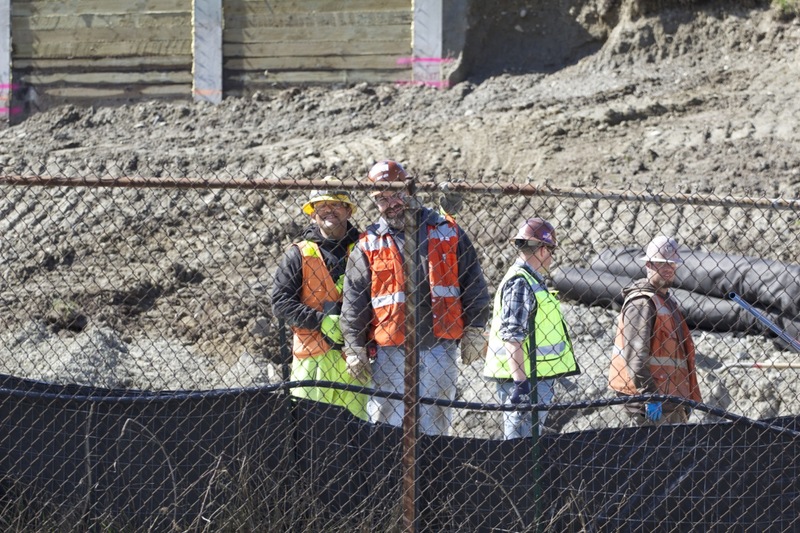 Go safely.” writes this Sound Transit staffer, as photojournalist Josh Trujillo also takes a picture. 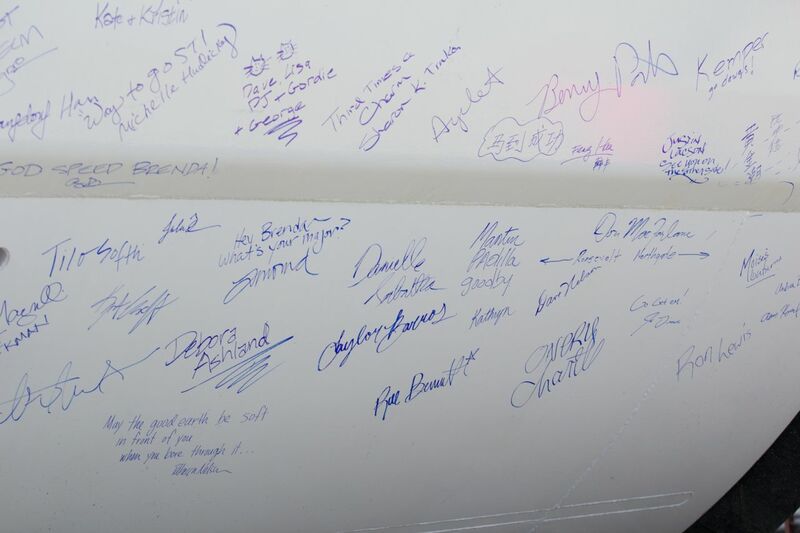 A selection of signatures and good wishes for Brenda’s journey. Sound Transit workers at the site wanted to get back to work, but didn’t mind standing around for a picture or two. 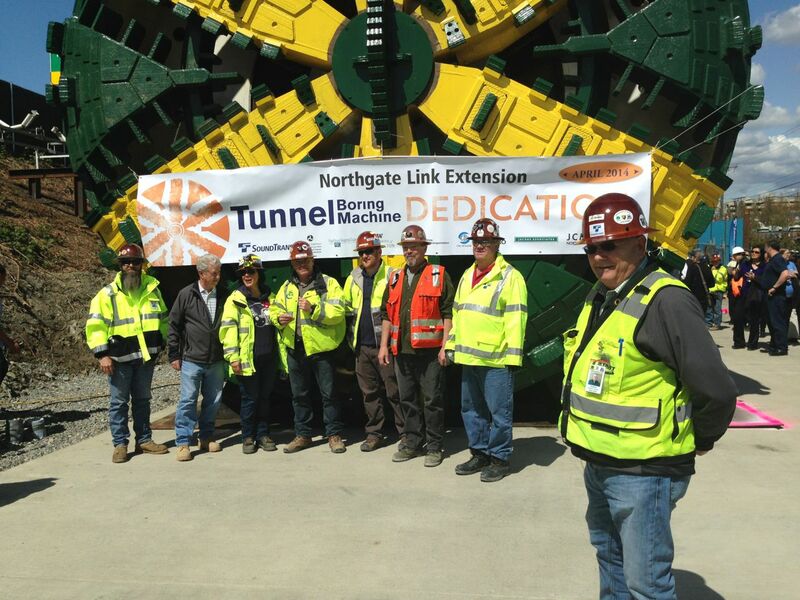 Members of the Sound Transit Northgate Link team pose en masse. 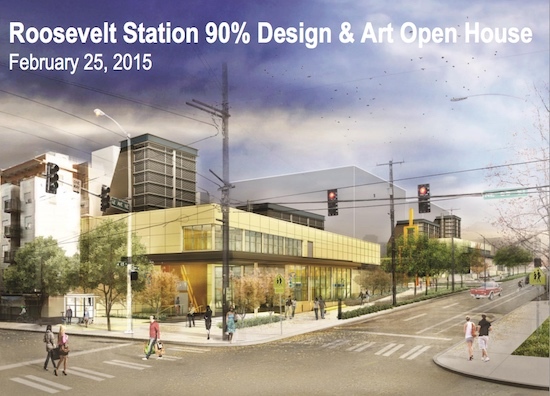 What single image would you use to represent the Roosevelt Light Rail Station? Or rather, what three adjectives and three landmarks you would use to describe the station area? Sound Transit is developing “pictograms” to identify the new transit stations that are opening in 2016 and beyond. You can help by completing their Pictogram Questionnaire, open now through Monday, April 14. First section of the Sound Transit Pictogram Questionnaire (click to start the survey). 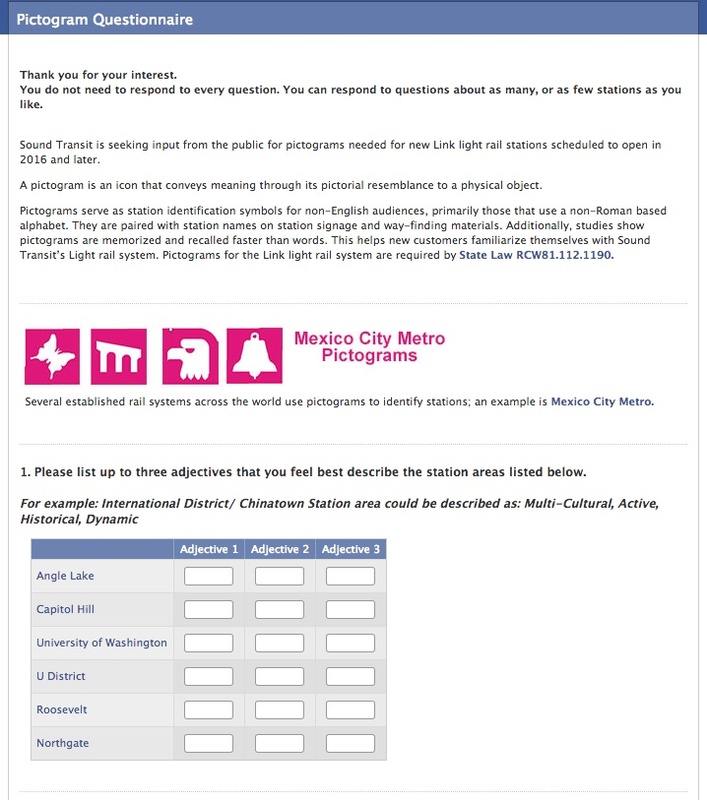 The pictogram may reflect the nature of the environment: neighborhoods, landmarks, geographic locations and may include points of interest around the stations. Existing station pictograms — Westlake Station all the way south to SeaTac/Airport Station — were developed from points of interest around the station and in the community. Those points of interest were connected like stars in a constellation, and an image representing the station was developed. The International District Station is a dragon. Pioneer Square is a ship. SoDo is an anvil. Westlake is… a tiara? I’ve always been curious and a little confused by these pictograms and admit to being pretty amused by this extremely thoughtful process (which we’ve heard that Sound Transit is NOT continuing for the new stations). Check out the “Stellar Connections” brochure explaining these transpo-constellations (1.1 MB PDF). 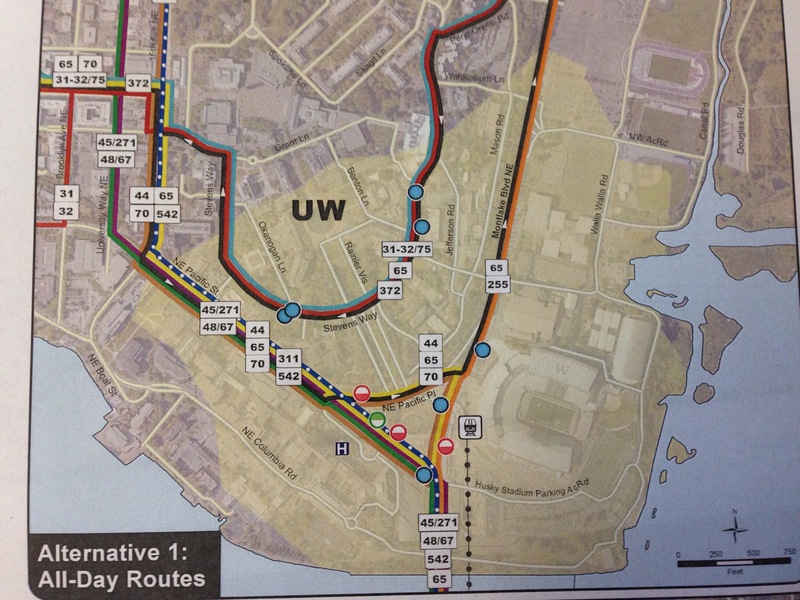 The University Link extension (Capitol Hill and University of Washington stations) are expected to open in the first quarter of 2016). The Northgate Link extension (U District, Roosevelt, and Northgate stations) are expected to be open for service in 2021. Approximately 8,000 daily riders are projected to board the train by 2030. The other station on the pictogram survey is Angle Lake Station, set to open in 2016 south of the SeaTac/Airport Station at S 200th St. 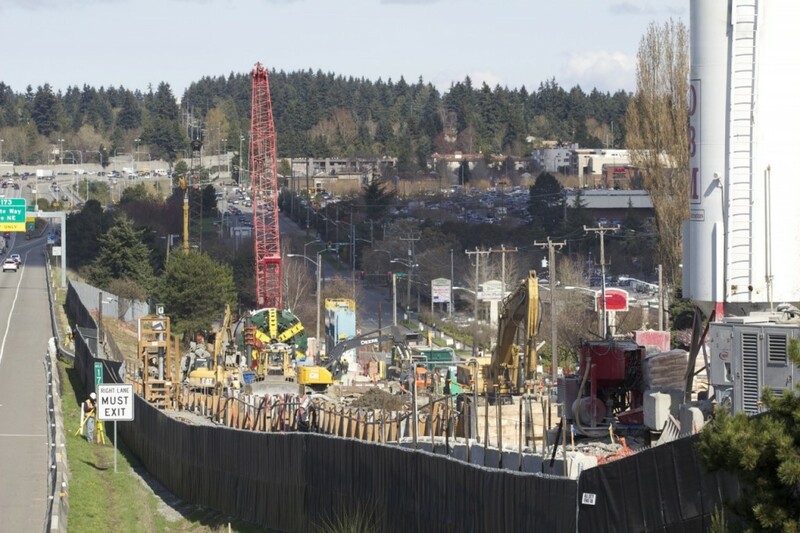 Blessed with some clear skies and lovely spring sunlight, we set out on Friday, March 21 to take some photos of the two Northgate Link sites seeing the most action right now: The Maple Leaf Portal and Roosevelt Station construction sites. We’ve done our best to explain each scene and the work being done to the best of our knowledge. We will, of course, add additional information for more expert sources if possible. Each of the photos below can be enlarged with a click of the mouse (or tap of the finger, mobile users). 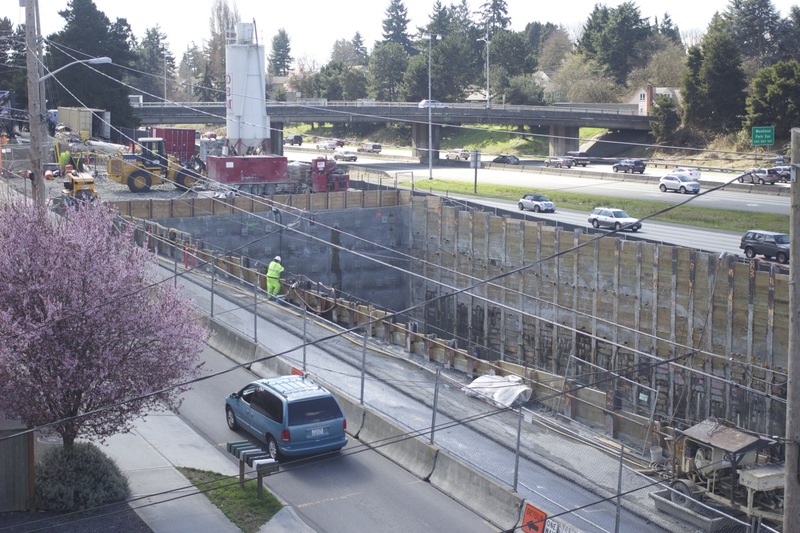 View from the NW corner of NE 92nd Street and 1st Avenue NE, looking north through the length of the Maple Leaf Portal (MLP) construction site. View east from the same corner. Double dump truck headed to I-5 up NE 92nd Street. Zoom from the same location. 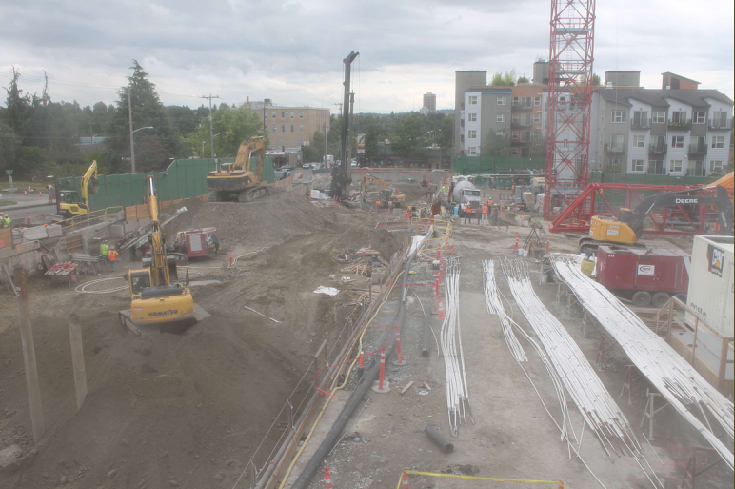 Sound Transit recently set up webcams at the active Northgate Link construction sites. The camera surveying the scene at the MLP can be seen on the far left side of the photo above. To see what’s happening from the camera’s viewpoint, visit this here EarthCam page. View from the NE 92nd Street overpass of northbound I-5 drivers all wishing they could be riding a train instead of driving. Another double dump truck headed out with muck from either the MLP or Roosevelt Station sites is traveling with them. On 1st Avenue NE now. No construction wall here to obscure one’s view of all the equipment and work being done. Looking south a bit here at the TBM. Looking north at a very large excavator depositing soil into a double dump truck. Close up of the TBM’s teeth, catching the spring sunlight. 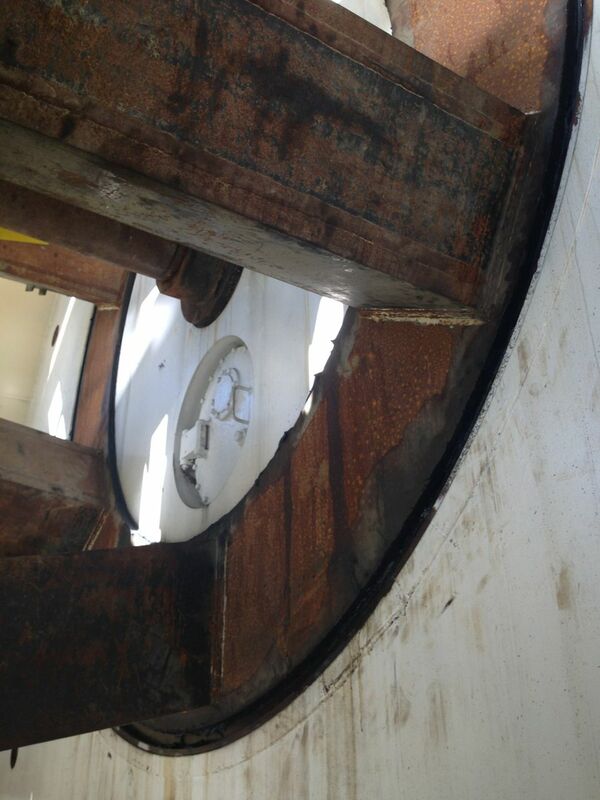 View of the whole cutter head of the TBM, with a worker conveniently seated on the ground nearby for scale. 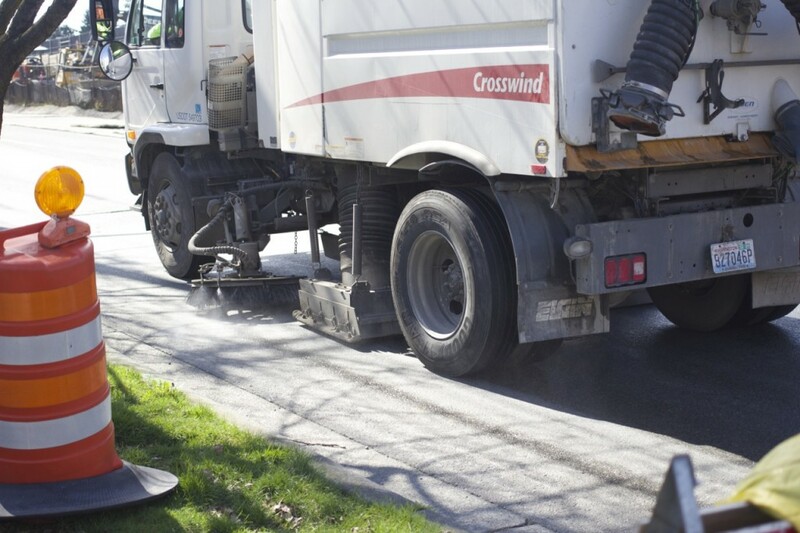 Street sweeper in action. Common sight, cruising near both the MLP and Roosevelt Station construction sites. Part of the overall construction mitigation plan (457 KB PDF). One of the pleasant side effects of doing reporting with a toddler around is that sometimes the construction folks wave and/or make faces. Thanks, guys. 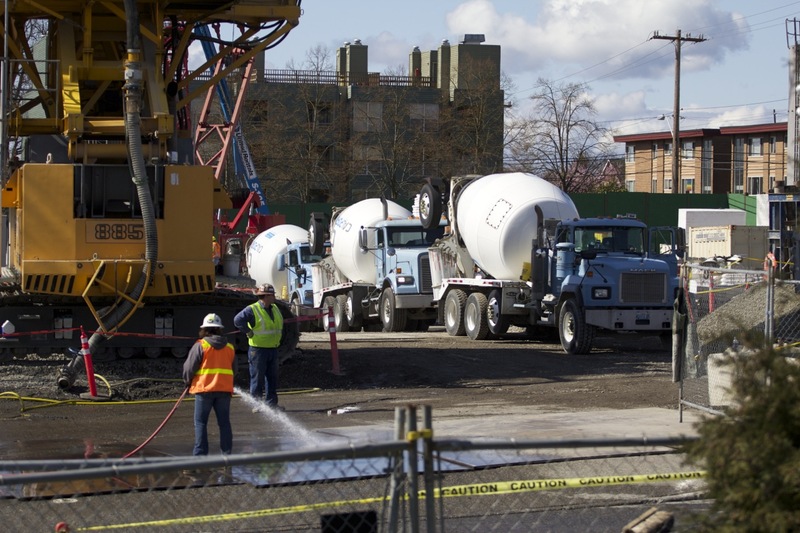 Should you have any of your own small children or other construction vehicle fanatics in your circle of friends, there is a lovely viewing point on 1st Avenue NE at NE 95th Street which includes a cement wall perfect for sitting on. Perhaps with a sack lunch. Or a froyo. Red crane “rabbit ears” behind the Dwell Apartments. This shot is taken from the parking lot of Roosevelt Square, looking north. 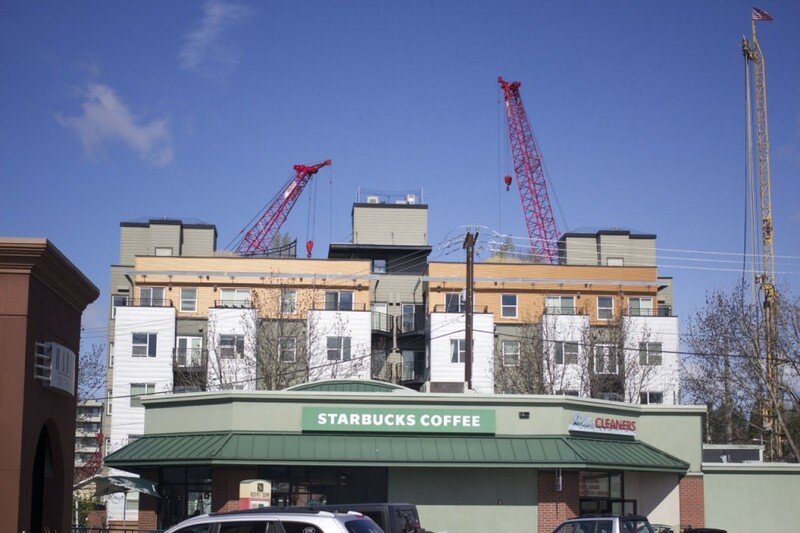 We’ve been able to spot these red cranes from all over Northeast Seattle. Red cranes again. 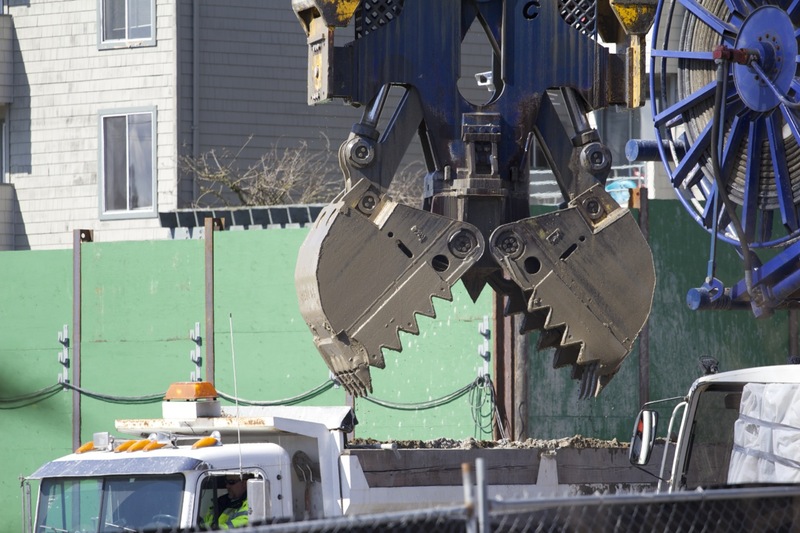 We’ve seen these machines used to move assembled slurry wall rebar cages from one area of the construction area (the Roosevelt Way NE side) to the others. This is a large hydromill, used to dig the 130-feet-deep-plus slots into which the rebar cages are later lowered. 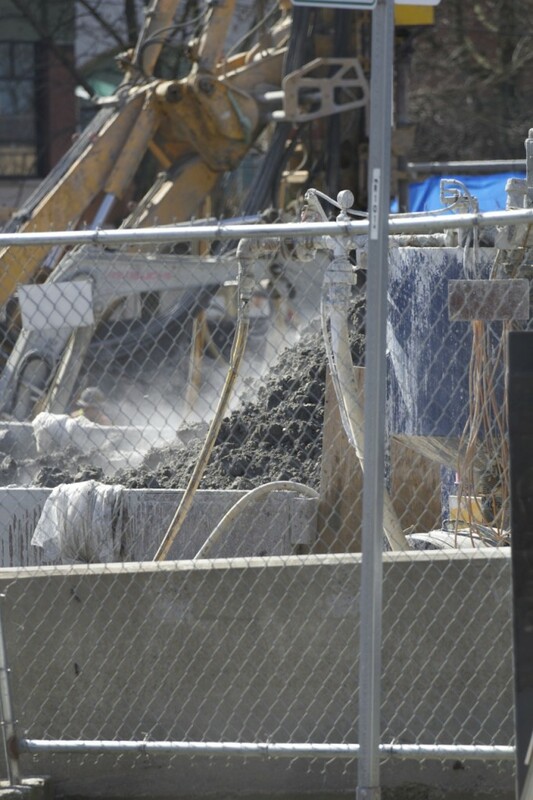 Then cement is pored in, creating the “slurry walls” that make up the outer walls of the underground station. The walls of the station are built underground BEFORE excavation happens! One of the rebar cages in some state of assembly. 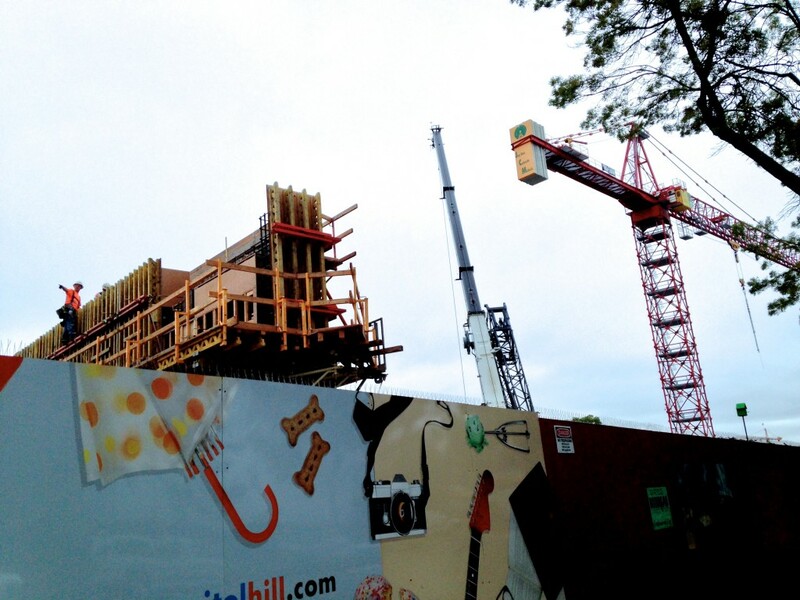 Unlike the Maple Leaf Portal site, the Roosevelt Station area has many thick and tall construction walls up already. This is great for local residents — part of the construction mitigation which lessens noise and reduces dust — but not so great for taking pictures. Looks good, though. A Roosevelt High School-inspired green. Construction-related vehicles have two entrances/exits at the Roosevelt Station site: One on 12th Avenue NE, and the other on Roosevelt Way NE. 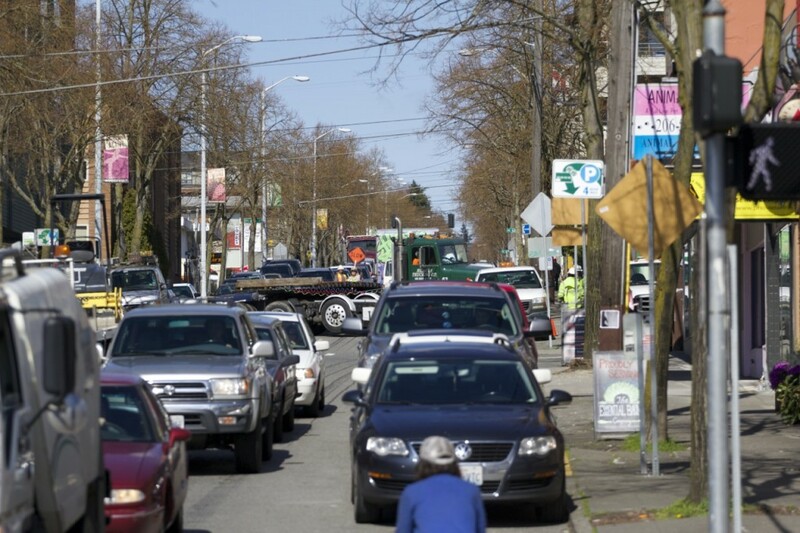 Above is a large truck backing out of the Roosevelt Way NE side with the help of a flagger. A little local flair/signage on the site’s chain link fence. This temporary fencing along 12th Avenue NE will be replaced by more thick, green construction wall in the future. Excavation work being done at what will be the southern entrance to the finished light rail station, on the NW corner of NE 65th Street and 12th Avenue NE. The piles of soil were steaming in the cool spring sunshiny air (though we suspect that part of this is due to heated water used in the excavation process — looking into it). Another, smaller hydromill, working in the NE corner of the construction site (near where the northern station entrance will be located). Here, the jaws just emptied a load of soil into a mostly hidden dump truck. Close-up, post dump. Look at those chompers! Lots of cement trucks on this day. They were queued up three or four deep, waiting to their turn to pour. 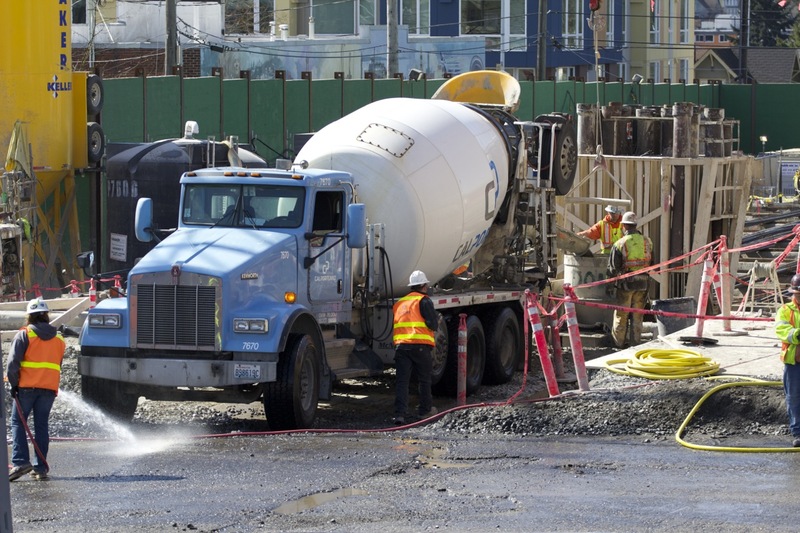 Cement truck during a pour near the center of the construction site. All vehicles leaving the site get a wheel washdown, another piece of the construction mitigation package. Close up after the pour was finished. 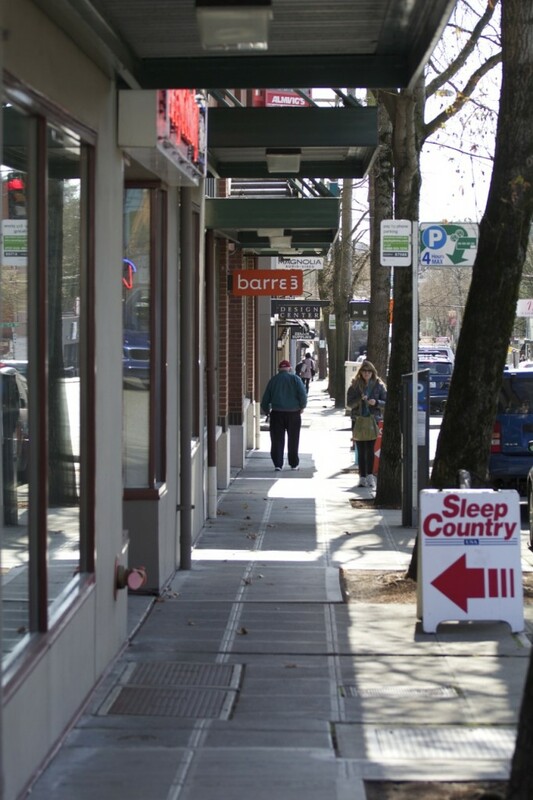 Cozy bit of sidewalk along the east side of 12th Avenue NE. The cement wall on the right side is the west side of the Roosevelt High School track and field. Another part of the construction mine field that is now the Roosevelt neighborhood is a new 42-inch sewer main under 12th Avenue NE. You know those metal plates you drive over? This shot shows you how deep the hole goes underneath your tire. 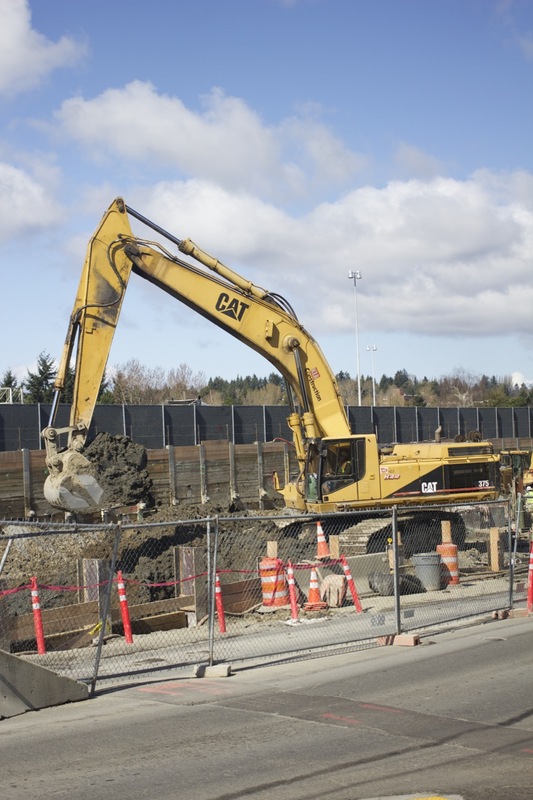 Soil excavation at the southern end of the construction site, along NE 65th Street. Excavated soil being transferred into an awaiting dump truck. 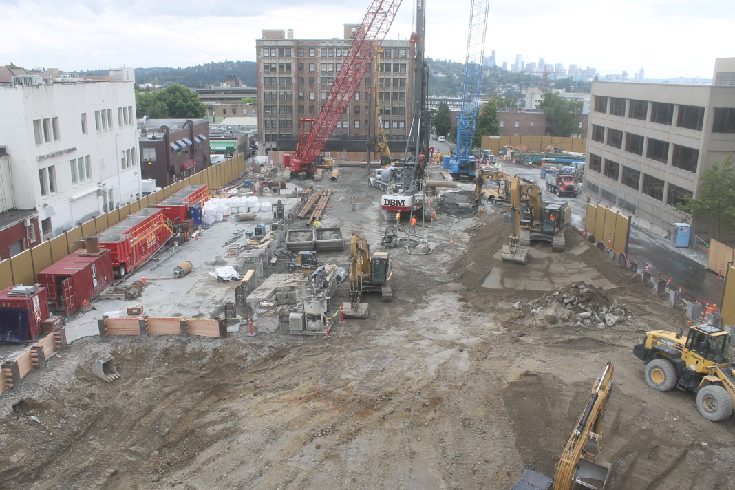 View from the east side of the site of the rebar cage construction. More steamy soil, moving out. The NW corner of NE 65th Street and 12th Avenue NE. Decidedly closed sidewalk, but that doesn’t always stop Roosevelt High School students trying to cross the street at open campus lunchtime. 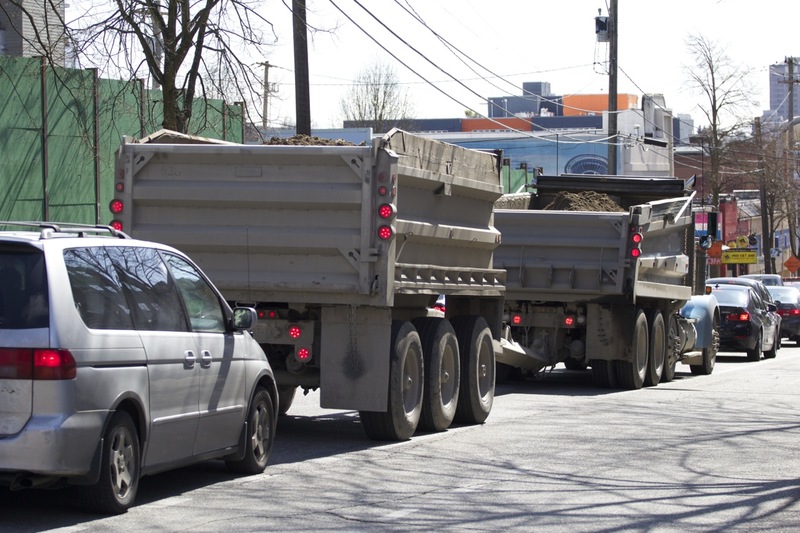 An empty double dump truck headed up 12th Avenue NE, ready to fill up with another load of excavated soil. 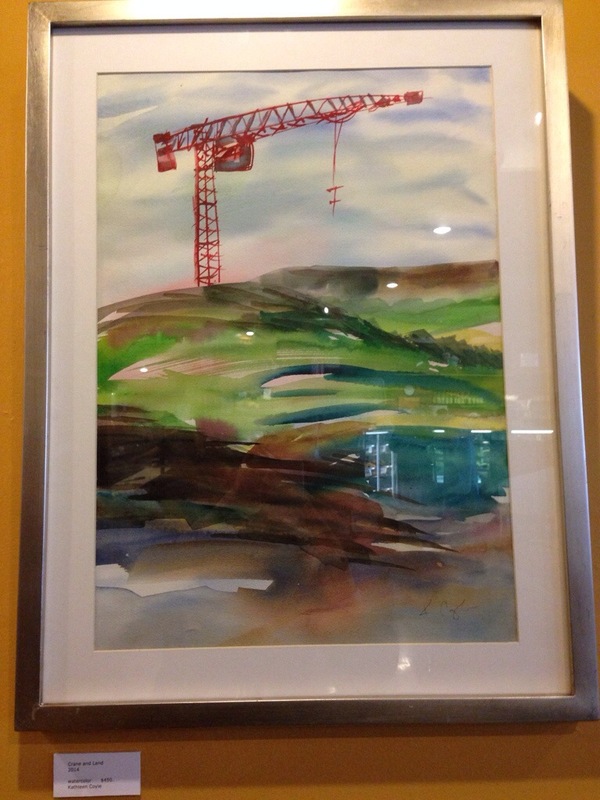 “Crane and Land,” water color by Kathleen Coyle. Photo taken in Grateful Bread (7001 35th Ave NE). There’s SO MUCH happening in Northeast Seattle in terms of large developments, we’ve decided to stop writing individual posts about them and give them their own PAGE. 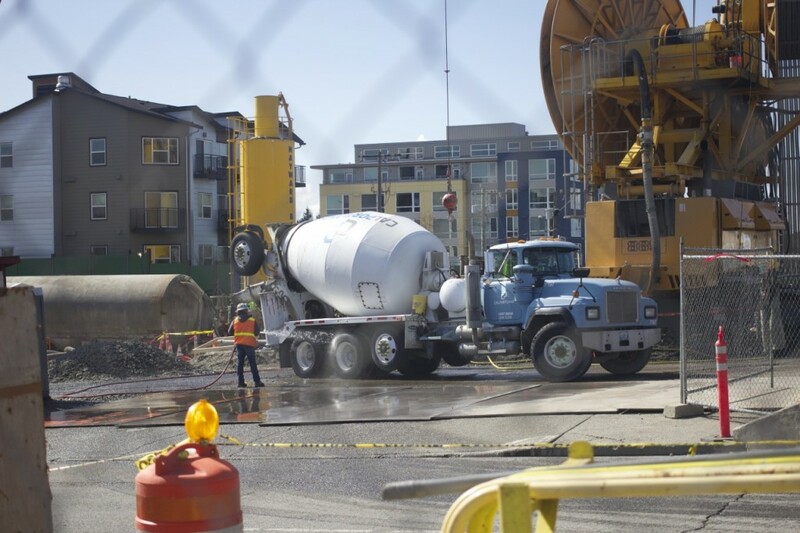 We hereby introduce you to: The NE Seattle Development Tracker page, accessible from anywhere on the Ravenna Blog via a new tab (just to the left of our Search box). Not all of the above information will be available for every project — some are far newer than others — but we’ll add new info and links as the projects progress. Curious about a project you don’t see on the map yet? Leave a comment below with the address of the project (or contact us here, via web form). We’ll do our best to find more information to add to the map. From 6-8 PM on Wednesday, October 23, Sound Transit will hold a Roosevelt Light Rail Station Construction Open House in the Roosevelt High School Commons (1410 NE 66th St.). Our live coverage of the event will start around 6 PM. Follow along below, neighbor!